Several years ago while traveling through the Yucatan, we really wanted to visit this natural Unesco World Heritage, located near Tulum. But we couldn’t figure out exactly how to get to Sian Ka’an Biosphere Reserve on your own. Tours to Sian Ka’an Biosphere Reserve from Tulum are the most common route and offered throughout the region. Some of those Sian Ka’an tours look great too, but they can get a bit expensive for budget-minded travelers. We knew that there must be some way to easily get to Sian Ka’an on your own. While trying to figure out how to get to Sian Ka’an Biosphere Reserve from Tulum, we researched on the web and asked around in Tulum, but no one seemed to have a clue. Popular guidebooks only referenced the Sian Ka’an tours from Tulum too, just as hotel staff did. Eventually, we pieced together information like a puzzle, slowly figuring out the logistics of how to get to take a DIY day trip from Tulum to Muyil, which has easy access to Sian Ka’an Biosphere Reserve. Through a bit of trial and error, we were successful. It turns out, despite a lack of info, Sian Ka’an is, in fact, easily reachable from Tulum, Akumal, and Playa del Carmen, among other nearby Riviera Maya locations. We had such a great time exploring Sian Ka’an on our own. The half-day trip to Muyil & Sian Ka’an is filled with fun and even a few unexpected experiences along the way. Since we were not able to find any detailed info on how to get to Sian Ka’an on your own, we decided to put together this travel guide on our blog, in an effort to give back to the travel community. That first visit was over five years ago. We’ve since found that this post has become a helpful piece of info as people for people to use on how to get to Sian Ka’an. As such, we now (2019) keep this travel guide up-to-date and even continue to revisit Sian Ka’an during our annual travels to Mexico. So we hope this detailed travel guide also helps you to reach this special place in the world! First, it should be understood that Sian Ka’an Biosphere Reserve is a massive area, sprawling across 5,280 km2 (2,039 sq mi). For perspective, Sian Ka’an is even larger than the nearby island of Cozumel! Being so big, there are multiple access points into Sian Ka’an Biosphere Reserve. Although you can access Sian Ka’an Biosphere reserve from both Punta Allen and Muyil, each of these two access points provides for two completely different experiences and contains two very different ecosystems. The other key difference is the ease of reaching each of these two Sian Ka’an destinations. If you want to see the oceanic side of Sian Ka’an, including beaches and saltwater lagoons, then the Punta Allen route to the Sian Ka’an may be for you. This is the marine part of Sian Ka’an Biosphere Reserve to go snorkeling on coral reefs. Even from the boat, you will get to see more marine life, such as dolphins, turtles, and manatees! Experiencing coastal Sian Ka’an is a great trip. The only downside is the extra time & effort or the higher cost it can take to reach from Tulum. It’s difficult to get from Tulum to Punta Allen on your own. If you have a rental car, it’s unadvised (often impossible) to drive there without 4WD under the current road conditions. If relying on public transport to get to Punta Allen, you must allow for multiple days, given the timing of the once-a-day colectivo (shared van public transport) from Tulum doesn’t reach Punta Allen until evening. A final consideration is taking one of the small-group Sian Ka’an tours that journey by land and sea all throughout this coastal portion of Sian Ka’an, all in a single day. These Sian Ka’an tours to the ocean side of Sian Ka’an can be worth the splurge, but travelers on a budget may find them to be a bit pricey. Check current prices here. If that’s not in your budget, you can still reach the fresh-water inland environments of Sian Ka’an on your own via Muyil, as described below. If you want to see the inland jungle, Mayan ruins, wetlands, freshwater lagoon, mangrove forests, Mayan-carved canals, and float down said canals, you’ll find this all from the Muyil access point to Sian Ka’an. You will not experience as much marine life as on the ocean side (no dolphins, turtles, etc. ), but it’s still a very beautiful natural environment. Logistically it’s much easier to get to Muyil on your own. The Muyil access point to Sian Ka’an is also much more cost-effective compared to Punta Allen. It’s also a quicker trip, as going to Sian Ka’an via Muyil is a very doable DIY trip that can be accomplished in a half day. This remainder of this article primarily goes into detail about how to get to Sian Ka’an via Muyil on your own. But first, here is some quick information should you desire to go the Punta Allen ocean route to Sian Ka’an instead. Visiting coastal Sian Ka’an is best pursued by overnight trips to Punta Allen, given the transport connection times. Alternatively, if wanting to visit the Sian Ka’an beachside in a day, a small-group tour is the way to go unless you have a car that can handle the rough roads. This option is best for anyone who may already have a car that can handle off-road conditions. It is possible to get to Punta Allen by car if you have an SUV with all-wheel-drive. When we were last there in June 2018, the pothole-ridden road to Punta Allen was in awful condition due to rains that have been eating away at this rough dirt road. We attempted the drive in a 2WD rental car, didn’t make it very far after deciding that our rental was going to get stuck or damaged in the process. The road to Punta Allen is not just potholes, but more like massive craters in places. It can be in bad shape, so just beware of this severe erosion if considering driving, particularly so during the rainy season. If attempting with a rental car, be sure your vehicle has good coverage and a spare tire. To get from Tulum to Punta Allen, simply head south on the dirt road past all the beachfront hotels and cabanas. When the hotels end, you’ll drive through a Mayan arch. A Sian Ka’an visitor center is just beyond, where you can check in and begin to attempt to drive down the very rough road ahead. This option is best for independent travelers who have at least 2 nights / 3 days to spend traveling to & from Punta Allen. There is a colectivo that departs daily from Tulum town and goes to a pier just beyond the Sian Ka’an visitor center, where it meets with a boat. This boat continues on to Punta Allen and arrives before night. The colectivo departs at 2:00 pm from the iTour Mexico agency, directly across from the Super Aki supermarket, located right here. Expect to pay $350-$400 MXN, each way, for the colectivo + boat. Given the timing of the morning return boat, it is required to stay overnight in Punta Allen, although you’ll likely want to stay at least 2 night (or more) to actually experience this area of Sian Ka’an during the day. Once in Punta Allen, it’s fairly easy to hire a boat to take you out to see the marine side of Sian Ka’an, for a price, of course. Be sure to factor in lodging costs too. There are a few fishing lodges in Punta Allen and prices vary. Pre-setup tents on the beach start at $20 per night for travelers on a shoestring budget and open to camping. Although beware that during the off-season of the summer months, these camps and even hotels tend to close-up until November. Hotels in Punta Allen start at about $70 USD, such as at the Hotel Cielo y Selva, which receives good reviews. If for some reason, the colectivo + boat option is not running, there is another colectivo option. It’s cheaper but less practical. This colectivo from Tulum to Punta Allen departs Tulum Pueblo on the corner of Centauro Norte and Avenida Tulum daily at 2:00 pm. The colectivo making the daily journey takes about four hours to complete the 55-km (34-mile) ride over the rough road, arriving in Punta Allen around 6:00 pm. If taking this colectivo, also plan to spend at least two nights at Punta Allen, because the return colectivo back to Tulum only departs from Punta Allen at the early hour of 5:00 am daily. If you don’t have a 4×4 to drive or don’t have three days to dedicate to the roundtrip public transport from Tulum to Punta Allen and back, then there is also the option to take a day trip for a full day excursion exploring the ocean side of Sian Ka’an. Sian Ka’an Ocean Safari provides a full day exploring the ocean and beachside of Sian Ka’an. Instead of dealing with the bad road for hours the entire way to Punta Allen, the drive is about halfway, to the Boca Paila Lagoon, where you’re transferred to a small boat for the remainder of the coastal voyage. Stops for manatee spotting and watching for dolphins ensue while cruising towards Punta Allen. There is snorkeling at a coral reef before the included seafood lunch. (It can be lobster when in season!) Keep an eye out for birds and turtles too during this excursion, which currently runs on Mondays, Wednesday, and Fridays with pick-ups available anywhere from Cancun to Tulum and in between (e.g., Playa del Carmen). We haven’t personally been on this tour but it receives excellent reviews by those who have. Check current pricing, latest reviews, and availability for this tour on our GetYourGuide affiliate. This Sian Ka’an Adventure on Viator provides a similar experience and with direct hotel pick-up in Tulum, but it is more expensive. This option is best for those who want to experience the intriguing freshwater environment of Sian Ka’an and/or only have a half-day to pursue a journey to the biosphere. Given the logistics of attempting a Punta Allen trip on your own and the added costs associated with taking an excursion to this coastal side of Sian Ka’an, exploring the inland portion of Sian Ka’an be the easiest, quickest, and most feasible. This portion of the Sian Ka’an reserve is easily accessible through the Muyil ruins. Visiting Sian Ka’an via Muyil is doable in a half-day and on your own. The remainder of this article provides detailed directions and instructions specifically on how to visit the Muyil section of Sian Ka’an on your own. Simply take Highway 307 south to the ruins of Muyil, which you’ll be able to easily recognize and will be on the left side of the road, just before km 205. It’s roughly a 20-minute drive south of Tulum town (22.5 km). There are signs for Muyil and a small parking lot that always seems to have spaces available. It’s easy to find. You can’t miss it. Note: a reader recently (April 2019) reported that the 205-km sign was missing and there is now and Oxxo minimart here. The buses from Tulum to Muyil come frequently, about every 30-60 minutes, so you can go to Muyil by bus at virtually anytime. There is no need to reserve a ticket in advance. There are usually many seats available. Simply head to the main ADO bus station in Tulum (on Avenida Tulum between Alfa and Jupiter). Buy a ticket from the ticket counter (not on the bus) and ask for a ticket to Muyil. The cost for the one-way ticket from Tulum to Muyil is $28 pesos. Important note: The destination listed on your ticket will NOT read Muyil, but do not fret that the ticket agent misunderstood you. Your ticket will instead list the destination as Chunyaxché, which is an alternate name for Muyil. 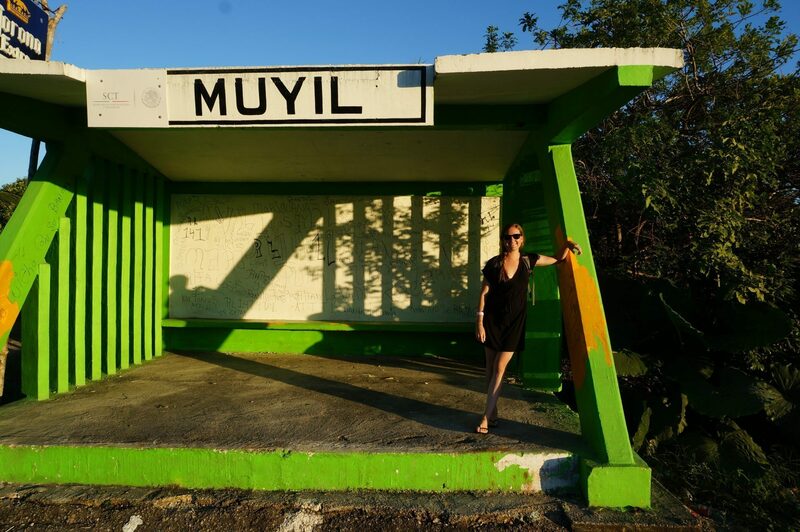 The bus ride is a quick 20-minute straight shot from Tulum to Muyil. The Muyil bus stop is actually a few hundred meters past the Muyil ruins entrance. But if you ask the bus driver nicely to get off at the Muyil ruins, he’ll likely oblige which will save you a two-minute walk. 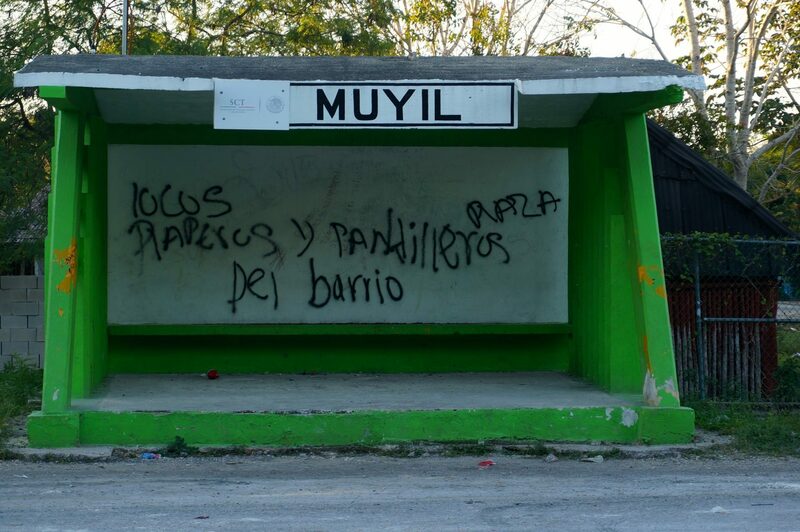 But if not, just be sure to get off at the Muyil bus stop, which looks like this (below). If you get off here, you’ll simply have to walk a few minutes to get to the ruins. Visit the Muyil ruins, then walk along a boardwalk in a jungle marsh, climb up an observation tower, and continue along the boardwalk to the boat docks. This takes approximately 1 hour (maybe 2 hours, if you take it really slow). We recommend this option if you have the time to explore. Get directly to a boat to explore Sian Ka’an. If you opt to bypass the ruins and go directly to the boats, then drive or walk south on HWY 307 just past both the Muyil ruins entrance and bus stop until you get to a dirt road on your left (East side of the road) at mile marker 205. It’s about a five-minute walk (or 1-minute drive) down a small dirt road, where there is a secure parking lot ($50-pesos), about a two-minute walk from the boat dock. But instead, we recommend visiting the Muyil ruins and jungle boardwalk first. Detailed directions are in the following section. And below is a map to help understand the layout of Muyil, the lagoon, and other points of interests discussed next. Source map: Google Maps, used with permission. You’ll clearly see the entrance to Muyil from the parking lot. There’s a proper ticket counter to buy your entrance ticket to this archeological site. Muyil entrance fee: $45-pesos, parking is free. Muyil hours: 8:00 to 5:00. Muyil restrooms: There are toilets near the entrance of Muyil. Plan to spend about 20-30 minutes exploring the Muyil ruins. It’s an interesting archeological site to visit. It may not be as impressive as the nearby Tulum ruins or even Coba. But part of the appeal of the Muyil ruins is that you’ll likely have this archeological site entirely to yourself since it is seldom visited. And it’s still quite impressive! The Muyil ruins have not reached the mass-tourism market, so it’s so nice to be able to enjoy the tranquility and history of this ancient Maya city. Once you reach the third main structure, Temple 8, do NOT follow the signs towards the exit. Instead, turn around and retrace your steps back to “the Castle,” pictured below. It’s easy to identify El Castillo (the Castle) in Muyil since it is the largest pyramid structure of the site. There is also a sign to help verify you’re at El Castillo. It’s important to locate this particular ruin, because it is behind El Castillo is where you find the nature trail and boardwalk to the boat docks. See below. Once you’ve located El Castillo, walk around to the back side of the Castle. It’s here that you’ll find a white plaque on the ground that explains what a Sacbe is (it’s a pathway the Mayans built). Just beyond that informational plaque, you’ll then see the actual Sacbe itself. The wooden sign with yellow paint, as pictured below, helps to ensure you’ve found the correct trail. Go on and walk down this trail into the jungle. It’s about a 5-minute walk until you reach a boardwalk with a formal entrance to the Sian Ka’an Biosphere Reserve. From this point onward you’ll be on this wooden path through the lush Yucatan growth. 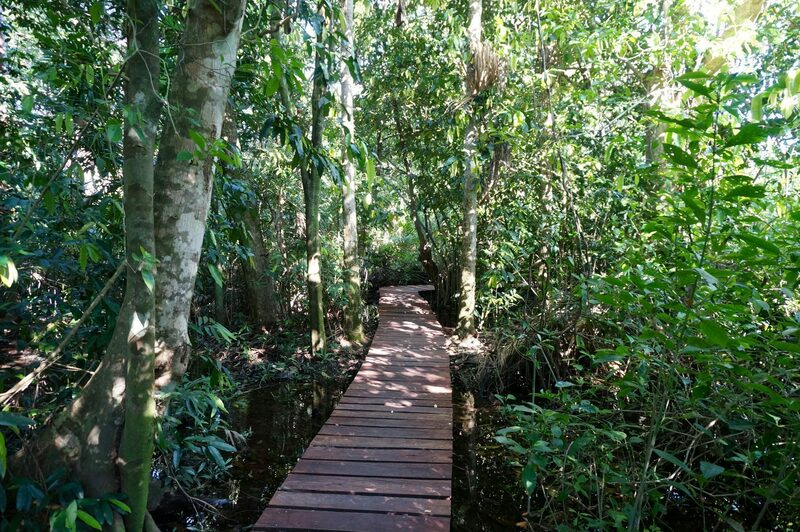 It’s a scenic 500-meter walk through the jungle marsh that winds over the wetlands. A sign indicates that it should take about 40-minutes to complete the walk, but we believe a more reasonable estimate is 20-minutes or so. If the bugs are buzzing (and they likely will be), you’ll walk briskly across the trail. Observation Tower: Just after you’ve gone about halfway across the 500-meter boardwalk, you’ll come to an observation tower. It is definitely worth the steep climb to take in the nice view of the nearby Muyil lagoon before continuing further down the boardwalk. This rickety tower allows you to see well above the jungle canopy. After the tower, the Canan-Ha trail soon opens up to a dirt road, where you’ll clearly see the lagoon and boat docks. If you don’t want to take a boat ride around the lagoons and Mayan canals, you can head back the way you came. Or walk down the dirt road, which is a more direct route back to the main road and Muyil parking lot. But we instead highly recommend taking in the full experience of a boat ride through the lagoons of Sian Ka’an and even a float down a Mayan-dug canal. This all tends to be the highlight of a trip to Sian Ka’an via Muyil. Taking a boat tour through Sian Ka’an is the main event of this half-day DIY trip. This boat journey travels across two scenic lagoons and weaves into a narrow canal. It’s a fun ride across the sparkling clear water! The price of the boat ride into the Sian Ka’an lagoon is firmly a fixed price of $600 pesos now $900 pesos per person. This seems to be non-negotiable and no discount is given for groups of two or more. So if there are two people, expect to pay a total of $1,800 pesos and three people will pay $2,700 pesos, etc. This fixed price of the boat ride (of what is now ~$48 USD per person) is a bit high by Mexico standards. Yet we found it to be such a great experience and hence recommend. It’s nearly two-hours long and you’ll likely even have a private boat to yourself. Note regarding children: While the adult price is firmly fixed at $900 pesos per adult, the rate for children is negotiable. $350 pesos is the going rate for kids. It’s also been reported that infants and toddlers have been permitted to go on the boat tour for free. (But you must bring your own toddler life jacket). Express interest about taking a boat trip with the guys at the dock. Mayan is their first language, but most speak Spanish. At the last visit, one guy also spoke perfect English. This should help to initiate the transaction. Even if your Spanish is really lacking and you can’t remember that phrase, still you should be able to work it out. They’ll know what you’re here for. You already know the price. Miming and smiling can go a long way. They’re all very nice, friendly, and non-aggressive. 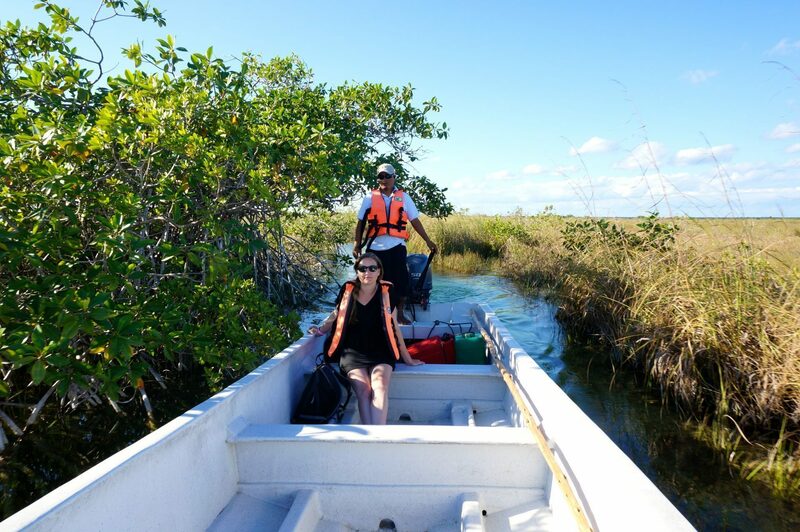 Get chatting with them and take this tour around the Sian Ka’an lagoons and canals! The guys usually arrive at the docks around 8:00 am or shortly thereafter and the last boat goes out around 4:30 pm. Again, we strongly recommend this Sian Ka’an boat tour if you can budget for the newly increased prices. It would be a shame to come out this way and miss it. This boat trip tends to be a highlight of any visit to this area of Sian Ka’an. Here’s a glimpse at what the experience is like to help decide whether to pursue. You’ll cruise around the lagoon and into narrow canals that are just barely wider than the boat itself. The water is crystal clear, so you can easily spot fish swimming around. But look up in the air too, as Sian Ka’an is known for over 300 species of birds. Eventually, you’ll reach a small Mayan ruin that was used for commerce centuries ago. The boat docks here to take a look around. Yet the highlight is next when you’ll have the opportunity to float down an ancient Mayan canal! The canal is lined with mangroves and the water is very clear. It’s also super refreshing, after that short but sweaty trek through the hot & humid jungle! A lifejacket is provided to float down the canal with. We recommend packing your own mask and snorkel to be able to view the fish and other critters that live amongst the mangroves. We saw many fish and crabs that we would have otherwise missed. The boatman stays with the boat as you float down the canal on your own, which takes about 15-20 minutes. He eventually meets you a spot where you can then walk back to the boat on a scenic boardwalk through a marsh. Eventually, this magical journey ends and you’ll return back towards Muyil through the same lagoons and canals you had entered. The boat excursion around the lagoons and canals, as described above lasts about 90-minutes or potentially up to 2 hours. It does not venture into the ocean environment of Sian Ka’an. You will not see dolphins, sea turtles, etc. There is a 4-hour version for $4,500-pesos (~$240), per boat, that the boatsmen at Muyil are currently offering. This expanded tour will continue further towards the ocean, so you may see some marine life. But it does not reach the barrier reef for snorkeling. The $4,500-peso (~$240) price seems outrageous to us. But it could be worthwhile if you have a group that can share the cost. If you happen to have six people, the price per person for this lengthier 4-hour boat tour would be $750-pesos, only a modest increase from $700-pesos you’ll be charged for the 2-hour boat tour. Otherwise, if you really want to see the ocean side of Sian Kaan, you’d be better off booking the Sian Ka’an Ocean Safari, which costs considerably less. which is a full-day, includes reef snorkeling, seafood lunch, and departs directly from Tulum. Upon completing the nearly 2-hour boat tour and float down the canal, you can either exit the reverse way you came in on the trail back to Muyil. But for a more direct route (recommended), simply walk down the dirt road back to Highway 307 where you’ll find the bus station for the return to Tulum. You can purchase a ticket directly from the bus driver this time, which should cost somewhere around $30-$50 pesos per person. Alternatively, there are many colectivos and taxis that ply this route. Expect to pay $20-$40 pesos per person for a colectivo or perhaps up to $100-pesos for an entire taxi back to Tulum. If you’re charged higher than that, we recommend declining. There will be more affordable options coming along semi-frequently, whether bus or colectivo. Although it’s just a half-day trip, it’s definitely recommended to bring a daypack. There are some essential items that you’ll need throughout your journey into Sian Ka’an. 👙 Bathing suit: Be sure to wear or pack a bathing suit so that you can float through the canal during the boat ride. The canal float is a must-do! 🕶️ Sun protection: The Yucatan sun is strong. Bring sunglasses and a hat. ☀️ *Biodegradable* sunscreen: The chemicals in sunscreen have been found to harm this fragile environment and visitors to Sian Ka’an are now being asked not to wear any sunscreen at all into the water. So bring a shirt for the water. But if you’re going to wear sunscreen, ensure that it’s biodegradable sunscreen and does NOT contain oxybenzone and octinoxate, like this Alba Botanic SPF 45 found on Amazon. Nearby cenotes are beginning to crack down on harmful sunscreens too. that works well for us at keeping those mosquitos away. 📷 Camera: You’ll probably want to take a few pictures to capture this experience, so consider bringing your camera and be sure to charge it the night before. Or at least bring a phone to snap a few selfies. 🤳 Underwater Camera: Bring a waterproof camera if you want to take it with you while floating in the canal. GoPros are fantastic but the $400+ price tag is not. Did you know that you can find knockoff GoPros on Amazon for only $50? That’s what we’re using and they work great! Check out this CamPark 4K Action Cam. Without an underwater camera, be sure that you’ll be comfortable leaving your camera with the boatman while you’re floating. (Note: The Sian Ka’an boat guides do tend to be entirely trustworthy, but you still may not feel comfortable leaving any expensive equipment). to keep all of your belongings safe and dry during the boat ride. Mask & snorkel: While you can still enjoy the canal float without a mask and snorkel, we strongly recommend to bring a mask. The boat does not provide them for you. So if you want to see this underwater environment, you must bring your own. The water in the canal is super clear and a mask will enable you to see fish, crabs, and other ecology living in the mangroves that line the canal. If you don’t already own a mask, we can suggest this US Divers mask & snorkel which is a fantastic mask for the price. You can also use it to snorkel at the beach reefs and in the cenotes during your trip to the Riviera Maya. Note: There’s no need to pack bulky fins for Sian Ka’an. It’s a leisurely float. 💵 Money: While the trip should total about $1,050 pesos per person, we recommend to bring slightly more, just in case any pricing has changed, an emergency, or if something else comes up. 🚰 Drinking water: Mexico is hot. Don’t get dehydrated. We recommend packing at least a 1.5-liter bottle of water per person. Bring it with you or purchase at the convenience store across the highway from Muyil. 🌮 (Optional) Food: There are some small local restaurants and convenience stores across the street from Muyil. It’s possible to grab a bite there. Otherwise, you may want to pack some snacks. 🧳 What Else To Pack for Your Mexico Trip? The packing suggestions above are just a few recommendations specific to Sian Ka’an. You may want to check out our Ultimate Packing Checklist for other packing tips and to make sure you haven’t forgotten anything before your trip to Mexico. This DIY trip to Sian Ka’an, the Muyil ruins, boardwalk, boat tour & float, and busing to/from Tulum comes to a total of $863 pesos per person. At the current rate, that comes out to about $56 USD per person. We do find it to be a bit high, respective to other activity prices we’ve encountered throughout many months of independent travel across Mexico. Yet we found the cost of visiting Muyil and Sian Ka’an to definitely be worth it. It makes for a great half-day adventure from Tulum. Plus, that $56 cost is significantly less than the $100+ Sian Ka’an group tours that go a very similar route to Muyil and the boat trip. For us, we like getting a good deal and don’t mind doing a little more work and having some uncertainty to save a few bucks. If that sounds like you too, then we recommend giving our DIY instructions a try. But if you’re short on time, want the ease that comes with a packaged tour, or desire to have more in-depth information about Sian Ka’an, then a proper tour may be the better option. There are a few companies in Tulum that you can book Sian Ka’an tours with once you arrive. The going rate is more than $2,000 pesos per person. We’ve heard some complaints with communications when trying to book such tours with these local operators via phone and email. Also, such Sian Ka’an tours don’t run every day of the week. So if taking a Sian Ka’an Biosphere Reserve tour, then we recommend going trusted sites like this tour on GetYourGuide that goes to Muyil and the boat trip and has a track record of excellent reviews. Check reviews and availability. They are always reliable, have an up-to-date calendar, you can seamlessly book online in advance, you can view verified reviews, receive confirmation for your booking, and a free cancelation policy at least 24 hours in advance. If booking a Sian Ka’an tour, you’ll undoubtedly pay more than the DIY version outlined in this article. But those small group tours do include the convenience of hotel pickup from all over the Riviera Maya, snacks, drinks, entrance fees, guide, etc. This all can help to justify the higher price. We find the Sian Ka’an tours can be really worth the cost for the ocean route towards Punta Allen, like this Ocean Safari, where there’s snorkeling on coral reefs, other marine life encounters, and a seafood lunch included. But the biggest benefit to going with any Sian Ka’an tour is the added information you’ll receive. A guide will be able to share so much more knowledge about Sian Ka’an than what you’ll find by doing-it-yourself. This convenience and knowledge does come at a higher cost, so simply weigh out what is more important to you personally. Have You Visited Sian Ka’an? If you’ve ventured out to Sian Ka’an on your own, please let us know in the comments. We’d love to hear about your experience. Also, since this post has become a resource for people traveling to Sian Ka’an, we do try to keep it up-to-date with any changes over time. So if you’ve gone and have noticed that any of this (prices, procedures, etc.) have changed, let us know and we’ll edit the post to ensure it remains up-to-date into 2019 and beyond. Readers have most recently (mid-April) informed us that prices for the boat trip from Muyil increased to $900-pesos. If you encounter a different price, please do let us know to help future travelers to the area. Gracias! Also, if you found this article helpful and if you like to travel, consider staying connected by joining us and a few thousand other travel-lovers on the Roaming Around the World Facebook Page, where we’re continuing to dole out travel inspiration and tips during our 5-year adventure around the globe to over 80+ countries. You can also find more blogs and detailed travel guides about Mexico here. Happy travels to Sian Ka’an and have a great trip to the Yucatan! Publishing note: This post about Sian Ka’an Biosphere Reserve was initially written in February 2014 and last updated April 2019. Hi! Me and my wife just did the trip to Muyil and to the lake, instructions are all good, thanks for the tips. The new update is in the 2-hour boat tour price, it is now 900 pesos per person and when talking to one of the guides he said that it will stay like that as there are new regulations of how many boats they can have so the authorities increased the tour price. We didn’t go for the tour as we think it was overpriced for what it really is but thought this info would be helpful. Cheers! Thanks so much for the update. It’s disappointing to hear they raised the prices again. You are the second person to report that this week, so it seems a new rate is indeed in effect. I’ll update the post now to let everyone else know. The boat ride is a great experience, but $900 is really getting up there in price. Thanks again for the update – very helpful! Thank you so much for posting this! It was really helpful. Today, April 19, we went out to see Muyil and do the 2 hr boat ride. Took the ADO bus (28 pesos pp) out and the collectivo back into Tulum (30 pesos pp) Unfortunately, the price for the boat had increased. On our way down the boardwalk we met up with a group who told us they had already been down at the dock and been told the price was now 900 pesos pp due to it being the holy week. They had declined. In our arrival we were told the price was now 900 pesos pp as they were now more restricted on how many trips a day they could make into the reserve. Seemed a bit scammy. Did not seem negotiable especially as there were many groups there going out. My partner was not down with the generally scammy vibe but I convinced him as I really wanted to see the reserve via boat. It was beautiful. We ended up on a boat with another couple (4 total on the boat). The man-made channel between the lakes was so cool and the float in the natural channel serene and we saw a few fish with our masks. I’m interested to find out if the price goes back down to 700 on a different day! Ah, it’s disappointing to hear they raised the price yet again. A year or two ago, they raised it $100 pesos. Now, another $200, yikes. We can only hope that it due to an effort that ultimate helps to protect this special place. Glad you were able to enjoy the boat trip despite the price hike. Will monitor to see if it stays this way. Thank you very much for this update and letting us all know. Gracias! Hi, I’ve just completed the half day trip to Muyil ruins and the canal float, taking the bus there and back to Tulum. The instructions are perfect and worked like clockwork in reality. All of the prices are still accurate. Thank you so much for this, I really enjoyed it! Thank you for this great article. Everything worked exactly as described!! Except our bus trip back was even less expensive 25 pesos each!! We also elected to eat lunch at the tiny restaurant at the end of the dirt road. 100 pesos for 1/2 chicken with slaw, rice, salsa, and tortillas and 15 pesos for a Fanta. Look for the sign Asadero de Pollos Muyil. The food was really tasty and we had a nice table in the shade while waiting for the bus. Nice! It’s always a happy surprise when something costs less than expected. That chicken lunch sounds fantastic and a good deal too. Thanks for the tip! Sounds like a perfect way to spend chowing down while awaiting a return bus. But now you’re making me hungry, lol. Awesome write up you guys, thank you both for taking all the time and effort to chronicle such a detailed guide! We are planning a trip in May and have booked tickets from France to Cancun. Would you guys recommend we spend 2-3 days at Sian Kaan? We are definitely interested in Birding and dolphin/whale watching. Also would you have any info on the best way to get from Cancun airport to Sian Kaan. Any recommendations on places to stay? Thank you so much again. If going towards Muyil, only a half-day or so in necessary. But if interested in dolphin watching, you’ll need to go the Punta Allen route. That can be done in either a full day tour or spend a few days there. Up to you. To get from Cancun airport to Sian Ka’an, you’ll first need to travel towards Tulum. You can take a bus (via Playa del Carmen), a taxi, or organize private transport. It just depends on your budget and travel style. Same with where to stay. There’s everything from 5-star resorts to cheap hostels. Thanks fo sharing your Info. Short tour (2h) is 700 pesos per person. We did the long one (3,5h) for 6000 pesos for one boat. I know that some others want 7000 and 8000 for a boat..
Short one is nice.. but only the long one you go until the sea and look for manati and crocodile. Thanks a lot foe all the information! Have been to Muyil and everything was as described. Right now am in Punta Allen and want to share some extra tips on how to get there without a tour from Tulum. In Tulum go to the itour agency in front of the supermarket. There is a bus leaving from there every day at 2pm. Roughly and hour drive until the visitor center of sian kaan. It costs 135 pesos. From there you can catch a lancha which will bring you directly to punta allen in around 1h as well for 250 pesos. Maybe more pricey than the collectivo but the lancha trip is like a tour in itself. To go back same way the lancha leaves at 7 20am from punta allen deck. You can also come back from punta allen at 3pm with the tortillero. He comes everyday from tulum to punta at 1pm and leaves back at 3pm. Not sure of the price yet as I’ll take it tomorrow but the camping am staying told me around 300 pesos. Will let you know. Thanks again for all your great advices. Thanks so much for chiming in with this added route! Someone on Facebook had recently messaged us about this too. Sounds like a great way to go and I’ll try to update the body of the post soon to include this. I believe it must be new, and possibly seasonal. We’ll be back in Mexico ourselves soon and we’re looking forward to checking this out ourselves. Sure, it’s a bit pricier than the collectivo but the time it saves and the hours seem well worth the extra few pesos! 🙂 Really happy to hear about this more convenient route from Tulum to Punta Allen! Gracias again! Hi everyone, many thanks for the detailed informations. We’re desperately looking for some natural treks and non-tourist traps around the riviera (all over Yucatan really, but doesn’t seem to have many) and the biosphere seems to have both, so this post and the comments are greatly appreciated. We’ll do the Muyil bit in half a day while staying a couple of nights in Tulum, but we also want to have full days of natural immersion, so we want to stay in Punta Allen for 3 nights. I was wondering if it’s possible to walk around the reserve starting from Punta Allen, and if there are enough trails to cover two full days of trekking? I see that from Muyil there’s only a 2-hour walk and we’re looking for longer ones. The pre-made tent option looks great, but we’ll have all our things with us so was also wondering if it’s possible to leave backpacks (with laptops etc) somewhere safe during the day in order to trek comfortably? Punta Allen is the end of the line. On one end, it’s ocean. On the other end, it’s simply a long narrow peninsula. In Punta Allen you’ll definitely be able to escape into nature and the escape the more touristic areas found throughout the rest of the Riviera Maya. But it may not quite satisfy your urge for trekking. There are certainly some nice walks along the shoreline, but don’t expect a network of hiking trails. After all, much of the Sian Ka’an is water, not land. Perhaps one option you could consider is storing your big packs at a hostel or hotel in Tulum, then negotiating with a taxi to take you halfway to Punta Allen in the early morning so that you could spend that entire day walking the rest of the way to Punta Allen. Then chill out there for a day or so before ultimately taking the colectivo/boat back to Tulum town. It’s about 40 kilometers from the beachside entrance of Sian Ka’an to Punta Allen, so that distance would likely prove too much to walk in a single day, particularly considering the heat. But perhaps tackling 20 kilometers or so could be more manageable and enjoyable. Just an idea. Hope it works out. Stop back by and let us know how it went. Have a great trip! John, Great job with sharing all those tips and information’s related to Sian Kaan biosphere. Appreciate your effort. Will try to follow your advices within next 3 weeks :o) Have fun with next travels! Thanks – so glad it’s helped! We hope you have an excellent time exploring Sian Ka’an and Mexico! Your instructions were PERFECT and led my boyfriend and me to one of the most memorable experiences of our Tulum adventure. The cost of the boat tour is still $700 pesos/person ($45 USD, but they prefer pesos) and worth every single bit. When we arrived, the organizers were surprised that we hadn’t made a reservation, but we got a boat within 10 minutes. They asked that we not use ANY (not even reef friendly) bug spray or sun screen, in order to protect the aquatic life, which makes sense and I felt inclined to respect their wishes. Make sure you cover up well, though. It’s a lot of strong sun. Our tour guides were Abner and Jaime. They were FANTASTIC. So welcoming and willing to work with us in our very limited Spanish and their somewhat limited English. They shared about their native Maya language and culture, and knew so much about that ecology of the place. The float we took down the canal was absolutely amazing! I recommend a snorkel mask. We saw a bunch of beautiful fish. It’s also nice to just float, so if you don’t have the mask, you’ll still have fun. We tipped the tour guides. This felt like the right thing to do. A note on finding the place: if you go straight to Sian Ka’an instead of touring the ruins first, the left turn to the parking lot is just after you pass the southbound Muyil bus stop and just before the northbound bus stop. Thanks again for this excellent guide to one of the area’s hidden gems. Thanks for the feedback! 🙂 And that’s interesting and encouraging to hear that they’re no longer allowing bug spray or sun screen of any kind. I will update this post again soon to reflect this change. Gracias! So glad you had a great time! Thank you for your elaborate instructions! We did the tour on December 19th. We entered through the Muyil Archaeological Zone and your instructions were 100% accurate. We had a wonderful tour, in which we saw a Tiger Egret from short distance. We enjoyed seeing the mangroves from close by during the float, and the many orchids and bromelias growing on them. Next to the boat landing the water is shallow, but you cannot stand there. What seems like a sandy bottom is actually a thick layer of spongy, ill-smelling mud (I found out the wrong way 🙂 ). Thanks for the added tip about the gate closing at 4:30. 🙂 And glad to hear you had a good trip, despite sinking into mud and hopping gates, haha! How would you recommend we make a trip from Barcelo Maya Palace to both Sian Ka’an and Muyil in a day or less? We would be in the area in early April. Catch a southbound bus or taxi from your hotel to Tulum (should take about 30 minutes) and then continue with the instructions provide in this guide. Alternatively, choose a tour that offers hotel pickup at Barcelo Maya Palace. Thanks for the pointers as it was exactly what we were looking for. We visited the biosphere today and prices haven’t changed. It was 50 pesos for parking and 700 pesos per person for boat ride. We had a guide and captain of whom both spoke good English – Ricardo and Santiago. We also noticed many other guides speaking English and a female guide spoke French too. Floating on the longer canal to the Mayan temple was also a kool experience. Thank you so much for the detailed information. We visited there today planning to take the 4 hours boat trip. The price was not 4500 per boat but 8500!!! Eventually we took the 2 hours trip which was fun. We arrived around noon and they had only one boat left for 2pm. So if you are coming on the peak season try to book in advance (I don’t know if this is at all possible). The Mayan ruins are nice but you don’t get a real feeling of a jungle walk, it is short and the wooden deck kills the natural feeling. Excellent advice, and all accurate as of 23 Dec 2018. Not much fauna around when we visited around 3pm. Boat drivers seem more interested in getting you to the float part of the canal, and somewhat at a loss for what to do with you if you don’t want to do that. Thanks that the write up! We went to Muyil and Sian Kaan today. It was marvelous! Thank you so much for this post it was super helpful. Also, there is now a boatman hanging out at the entrance to muyil and he organizes the trips for everyone. He had a helpful little map and told us where to meet him. Then when we got to the dock he matched us with our guide, Rodrigo, and then we were on our way! Thank you! This was so helpful 🙂 I had a great visit thanks to your detailed advice. Hi, am planning to go in April and do the trip on my own – is it safe? I’m not aware of any major safety concerns in taking the day trip to Sian Ka’an. We’ve found it to be safe. You guys are saviors- this is exactly what I was looking for! Can’t wait to explore it on my own in Feb.- thanks for putting in the work!!! So glad it’s helped! Have a great trip in February and hope you enjoy this special place! WOW… Thank you! I thought I would never find this info. I do have one additional question: if we are leaving Tulum and doing this excursion on our way further south, we will have our backpacks with us. Any idea if there is somewhere to leave bags at the entrance at Muyil? So glad this proved helpful. Regarding your packs… there’s definitely no left luggage or anything like that. You may be able to ask the Muyil ticket guy if he’ll securely hold your bags in his office and offer him a nice propina to do so. Worst case scenario, you’ll be stuck carrying your packs through Muyil and bringing them on the boat with you. But if you feel comfortable leaving your packs with someone at Muyil, I’d imagine you’ll find someone to help you out. There are a few stores and such across from the ruins too. If you do leave your luggage, it’s probably a good idea to still keep a daypack on you to carry any valuables. If you give this a try with your backpacks, please stop back by this page to let us know how it went. Gracias! And have a great trip! All the information provided here was so helpful that I wanted to provide updates/feedback after my trip. My husband, two children (ages 1 and 5) and I visited via Muyil a few days ago. My husband is originally from Mexico, and I lived there for a few years too, and we had made several trips to the region previously which is why we felt comfortable doing this outing with such young kids. I wanted to share that I asked our guide at Sian Ka’an if there was a cooperative of boat guides and he said that there’s are in fact three cooperatives of guides, all of which have to follow strict licensing requirements. He also volunteered that the tour is more expensive because a portion of the money goes to the preservation of the preserve and that it is intentionally more expensive to prevent the masses from visiting so as to minimize damage to the reserve and especially the ancient canals. (Although it seemed to me that lots of people are making their way to the reserve regardless!). I also wanted to mention that we got to Muyil around 9am and decided to do the Sian Ka’an reserve first to avoid being out in the midday sun and heat. I just asked at the Muyil entrance booth which way to go and was pointed down the street to the next entrance on the left side of Highway 307. After doing the tour of Sian Ka’an, we went back to Muyil and then walked to the observation tower and then back to Muyil again. I would recommend that others consider this too if you’re vising on a warm and sunny day (and when is it not warm?!?) and want to avoid the worst of the heat, as both Muyil and the walk to the observation tower and are well shaded. 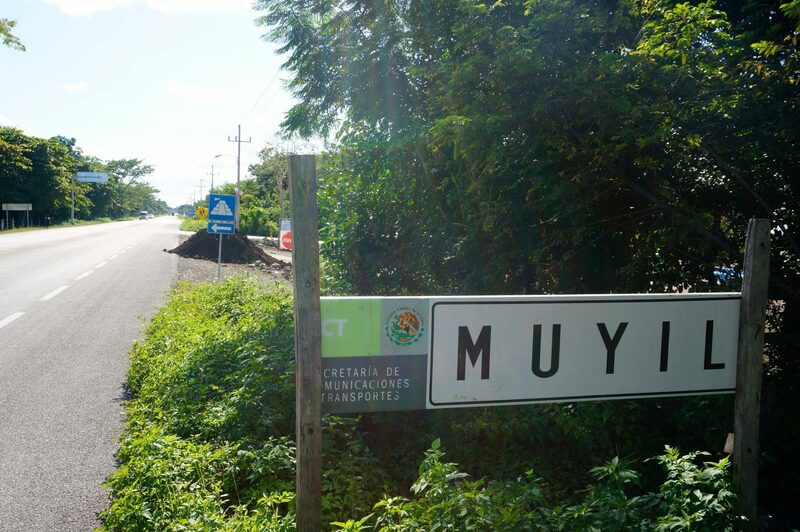 If you have a decent command of Spanish, you can just ask around once you get to Muyil and people will point you towards wherever you want to go. We never would have made this trip without this posting, though, so thanks so much for opening this door for us! Thanks so much for sharing your experience, added info, and tips! It’s nice to hear that the seemingly higher cost of the boat trip helps with the preservation of this special place, especially the canal. And thanks for the suggestion going out on the boat first to avoid the midday sun out on the water. That makes sense! We like to go to Muyil and the boardwalk first to then cool down on the boat ride and the canal. But the reverse way that you describe certainly has its advantages too, particularly so if going in the morning. 🙂 Glad you found this helpful and thanks to you too for stopping back by with this helpful comment! Thanks very much for these instructions. We followed them successfully on November 23, 2018 (I wrote them down anticipating there was no internet there) and it was great fun. Two things to add: 1) Be ready to wait for the boats, especially if organized tours are arriving–they will take precedence. We arrived at the dock at 11am and were told by Antonio, the man who said he was organizing the boat assignments, that it would be 20 minutes till our party of 8 could get on two boats (and be joined by 4 others to fill in the seats, 6 per boat). Every 20 minutes he promised another 20 minutes. We finally launched around 12:30pm. 2) Leave your shoes in plain sight if you do the canal float. The boatmen will kindly bring them to you for the 10 minute walk back on the boardwalk, but not if they can’t see them (for example, if you put them in a bag or under a hat). Thanks so much for stopping back by with the helpful added info. Good idea about the shoes! We walk back barefoot but would be nice to have our shoes. Good to know! How annoying about the 90-minute wait. Too bad but hope the boat ride was ultimately worth the wait! 🙂 We’ve gone a few times now and have never seen a wait for the boats. Perhaps it was a busy day and/or word about Muyil and Sian Ka’an is starting to get out. I anticipate that Dec-March will likely be busy too, so that’s really helpful to know for others to potentially budget a wait into their time. Gracias! Visited yesterday (April 3 2019) on the way out of Tulum. Prices correct. We took an extra 50 pesos to tip our boat guide though there was no pressure to do this. We wanted to do the boat trip first, in the morning, in order to keep the ‘no sunscreen’ part out of the midday heat. We therefore were looking for the dirt track turn off at the km 205 sign to go to the boat dock car park. We knew we were close, having located km 206 and 204 (!) however after some confusion we think the sign has now been taken down, and replaced with a new OXXO convenience store. After a couple of wrong turns ending in nothing, we found the right track was in fact directly opposite OXXO and between the 2 bus stops on each side of the road. Once located, as mentioned it is a short drive/walk until you meet a little hut and a cordon stopping you driving any further, with the car park on the right. It cost $50 pesos although we weren’t entirely sure if this was for parking or entry! But either way not much. You then walk perhaps another 2 minutes to reach the boat dock, so they may have slightly moved the parking area as the article description mentions parking was AT the dock. When driving or walking down this road, we noticed that if you look carefully there are some amazing hidden bits of Mayan ruins and carvings within the banks either side of the road. There’s nothing to call them out so it felt cool to have spotted them. Once we got down to the boat dock, there was an amazing gathering of probably 2 or 300 butterflies, which apparently come in April/May to drink the fresh water from the lagoon. It was quite magical to see them all dancing around. As the article mentions, bobbing down the Mayan river is definitely the best part of this trip. It’s very relaxing and serene. It probably takes half an hour to bob the 1km, til you get off and return on the boardwalk. A good tip from our guide was to wear your life jacket like a nappy (legs through the arm holes) for an extremely comfortable bobbing technique! We then did the reverse route back through the jungle boardwalk, up the observation tower (feels a bit hairy but worth it! Though might be a bit steep / scary for kids to climb) and out through the ruins. We stopped for lunch at a little cocina opposite the ruins entrance which was delicious and only 130 pesos for 2 people, for panuchos, quesadillas, a coke and fresh coconut water (a joy after coming from $$$ Tulum!). They were super friendly too, would definitely recommend. Regarding the Tulum/Punta Allen side of Sian Ka’an, the day before, late evening – about 4.30 – we drove all the way down to the arch at the bottom of the Tulum Beach road where Sian Ka’an starts. We paid 36 pesos each to go into the reserve, charged at the arch. Last entry is 6pm but there is no limit on last exit so you can stay in as long as you want. We had read a lot online about the road being impassable in a non-4×4 hire car however, whilst it was fairly slow going with bumps and potholes, we didn’t find it prohibitive (although we can only speak for this day in early April, we could imagine how rains and bad weather might make it too hard). Taking it slow, our small VW Polo did ok (but got very dusty). We stopped off at the visitor centre – perhaps 20 mins in – to walk down the lagoon-side pier and then drove down to the Boca Paila bridge which was spectacular. Although the map makes it look like it’ll be a scenic drive the whole way, almost 100% of the road to that point has the views of the sea / lagoon on either side obscured by thick foliage, with the only passable trail to the lagoon that we found to be near a sign for fishing trips, which lead to a short pier. However when you get to the bridge, both sides open up to give spectacular views. We saw a huge croc and were blown away by the views. We thought it well worth the trip and it was a nice time of day to do it. Thank you so much for putting this resource up, we really appreciated it! Happy travels everyone. Thanks for the update about the Oxxo. That is definitely a very new development. When we were last there, about eight months ago, didn’t even notice any construction of Oxxo going on. Must have gone up quickly! Shame they may have removed the kilometer sign in the process. Gracias for informing us on this new development which really helps us to keep this post up-to-date for future travelers to the area. Yeah, that alternate car park is indeed a minute or two walk to the boat docks. I guess it just seems “at” the boat dock comparatively to parking at the Muyil ruin site. Thanks for pointing this out, as I’ll edit to be more clear. Nice to hear you made it out to Boca Paila and so cool you saw a croc! This time of year, and even into May, does tend to be the best time to attempt that road. Once the rains begin again in June, it’s a different story. Thanks for much for sharing the details of your experience at Sian Ka’an! Thanks so much for your detailed description of how to go here. We went there on Monday, 14th with a rental car to the Muyil ruins and had the place nearly to myself. The boardwalk through Sian Ka’an was great, saw some interesting fauna ( flora was also exciting for Europeans, but since it wasn’t our first selva experience, were not impressed). We also got to the boat, where the guide carefully and very catchy explained us when and how the channels was built, what kind of animals can be seen in the reserva. He also shared some personal experience, since he was working in the reserva for 18 years. Funny is that right at the end of the boat trip, the weather got so bad and a rain was pouring for 30-40 mins. However, this didn’t spoil the experience – rather the opposite, just added a bit more wilderness to it. Thanks so much for sharing your lovely experience. It’s so nice when you can get a boat all to yourself. And great to hear that your boat guide was so talkative and informative! That is wonderful, as it hasn’t always been the case in our experience. What an experience that must have been coming back in the storm. At least you were already wet, haha! Thanks to you both for such an informative write-up. This area of Mexico is filled with mystique and the lack of clear info of transport certainly adds to that! Thanks again for the guide! We visited about 10 years ago and rented bikes in Tulum. Had we more time we would have peddled all the way to Punta Allen. If you are prepared enough, camping along the way could be a real good DIY experience – we imagine, anyway! We did manage to explore some very desolate stretches of beach within the preserve and were saddened to see the amount of rubbish that washes up on this protected bit of land. Soon, we will be back again look forward to having more time to see Quintana Roo. Thanks again! Thanks so much for your detailed description of how to go here. I went yesterday in my rental car to the Muyil ruins and had the place nearly to myself. The boardwalk through Sian Ka’an was great, and actually had a lot more people walking it but from the other end. I saw perhaps 20 different bird species, and even a Coatin (an arboreal mammal that looks a bit like a cross between a dog and a racoon). I skipped the boat trip, and instead spent more time on the boardwalks in the inundated forest to observe the birds, and as it was later in the afternoon I even had that stretch to myself… as it apparently closes at 16:00. The ranger at the ruins/reserva entrance was kind unlocked the gate for me even though I was a bit late, as otherwise it’s necessary to walk the road back from the boat launch. Great trip! This looks a great trip! We’ll be in Tulum end of December, beginning of January. The only free date in our agenda is 1st of January to do this trip…. Do you think the entree will be open and the guys with the boats will be there? I would imagine that they’ll be there on New Years Day. I can’t guarantee it with absolute certainty, but I’d imagine there would be someone there to take you out in the boats. Worst case scenario, you’ll still be able to visit the Muyil ruins, take the boardwalk, and see the lagoon. But I’d guess that someone would still be there to also do the boat ride. That’s a busy time of year, so doubt they’d choose to forgo the business they’d receive that day. Have a great New Years in Mexico! It has been a year+ since our visit to Tulum, and our family of five had the trip of a lifetime! The highlight of the trip was our visit to Sian Ka’an, which would not have been possible without your carefully outlined trip details! I cannot thank you enough for this little adventure you helped us to go one. Our family will remember this for a lifetime! Next we are considering Costa Rica….if you have any suggestion for similar, kid-friendly expeditions, I would love to hear about them! Thank you again…I really appreciate it! As for Costa Rica, there’s so much! Perhaps our favorite experiences was trekking around the waterfalls of Tenorio Volcano National Park and whitewater rafting on the Pacuare River, both of which would be good with kiddos. Thank you for this great advice! We were a group of 8 (4 adults and 4 teenagers.) Paying the costs of a an organized tour was price prohibitive (over $100 a person), so it was great to come upon this information. We followed it exactly, and it was perfect. Thank you again! I loved the detail – really helpful! Here’s a few additions that I wanted to pass along to others: 1) Internet access is non-existent, so don’t expect to be able to follow these great instructions on the fly. I took screen shots of the important pages and it came in handy. 2) we ran into some issues at the boat launch because (I think) we arrived at the same time as some tour groups who were basically doing the same thing we were – trying to find a boat for a group. We did eventually get a boat, but had to get their attention which took a little time and Spanish skills. We arrived at the boat launch at around 1 or so. I recommend getting an earlier start and you may be able to avoid competition on the boat arrangements. Other than that the visit went off without a hitch and it was a highlight of our trip to the Yucatan. I highly recommend! The float down the Mayan canals was fantastic! Thanks for dropping back by with the comment and feedback! That’s a helpful point about the lack of Internet and I’ll add that to this post when I come back into here to update it again. When we were last there in June earlier this year, we also did not get any data on our phone and we were even using a local Telcel sim card. 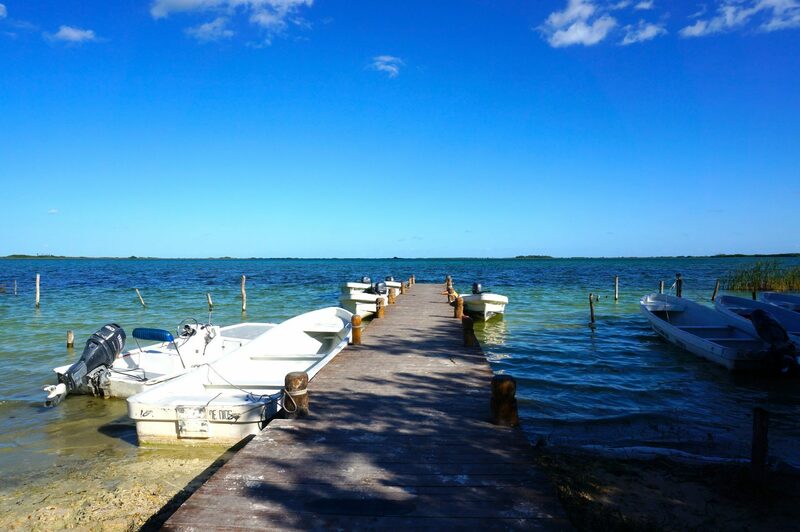 Your encounter at the boat docks sounds about right. We always get a chuckle about how lackadaisical the boat guys are, sometimes to the point where they don’t even seem interested in potential customers. They’re such a mild-mannered bunch, which is completely different to the sometimes-aggressive tour hawkers and promoters working off commissions found in the tourism hotspots nearby. Glad to hear you were able to work it out with some limited Spanish, despite arriving at the same time as a tour group, to ultimately have a fantastic float down the canal! I usually don’t write comments, but I want to express gratitude. Great Advice. We followed all your tips and everything was as you said. Loved the floating, I felt like Baloo from the jungle book. We got on one of the last boats (the last leaves at 4.30pm) and it meant it was just me and my girlfriend floating the whole way. Great day out. Thanks for the detailed and informative instructions! Keep up the good work! Sounds like a most-pleasant way to spend a late afternoon. And thanks for an update on the 4:30 timing of last boat out – will add that to this post. My girlfriend and I just arrived from the Muyil Trip. Everything was like you described. Thanks a lot John, your blog is amazing and so helpful. It made everything really easy. So glad it proved helpful and you have a great trip! Thanks for stopping back by with the feedback! Like many others, I could not believe it would be so easy. The Hostel travel guy did say it was impossible and no bus goes to Muyil! Well, it’s so easy, I just followed your tips and all worked perfectly. For the boat ride, since I was alone, they put me with a family that booked a private tour. Luckily, they didn’t mind. I skipped (I know, terrible mistake) the swimming part but that’s me. Plus, I had some DEET on, and didn’t want to kill all the fishes. Thanks a lot, I’m really gaining confidence in visiting on my own. I did Coba the day before, again on my own, and it also worked perfectly well. Updated schedule: the Mayab bus leaves every half-hour (8:30, 9:30 and so on). Price is cheap, 28 MxP one way. To come back, I jumped into a collectivo after waiting almost one hour for the bus. Collectivo was 40 MxP. When I went in, I notice the bus was coming in the back… Oh well, I stayed in the collectivo anyhow. It’s funny how so many hotels and hostels can’t advise how to get to Muyil & Sian Kaan, yet it really is so easy. 🙂 Glad you found it as such and are gaining confidence with independent travel down here! Thank you so much for the added info and an update on the bus times. Wow what a great report. We want to do this trip in the next days. Can you explain how to make sure that there will be guys for the boat trip at the dock in Muyil. Which is the nest time? There always seems to be boat guys there ready to take people out during regular daytime hours. We even last visited when it was raining and there were still guys there ready to give a tour around the lagoon. Muyil is open from 8:00-5:00 and the guys running the boat trip roughly follow a similar schedule. Your post is definitely helpful especially who loves to travel and maybe one day want to take an adventure in Sian Kaan. I would love to explore there someday. Thank you so much for your detailed instructions, we had such a great day! Everything was exactly how you described and so much easier to know what to expect with our 6 year old. He absolutely loved it as much as we did! Always glad to hear this post is continuing to help people know what to expect. And what a great natural experience for a 6-year-old! 🙂 Thanks so much for stopping back by our site with your feedback. Visited the ruins and forest today, April 1st, enjoyed the trip. Travelled from Akumul on the collective, 110 each, well worth it. 45 to get into ruins and 50 for the forest. Took the boat trip 700 each really nice to see no other tourists. Pleasant day out only downside I did not see much wildlife apart from a few butterflies and fish. Thanks for the advice and tips really helpful. Thank you so much for this detailed information. My family and I will be in Playa del Carmen and Tulum for spring break 3/24/18 – 34/1/18. My husband and I were in Playa in December of 2016 but didn’t have time to explore Sian Ka’an. We hope to make it there with our kids and am glad to have detailed information to prepare for this part of our visit should we have time. We’re so happy that you’ve found our guide to Sian Ka’an helpful! We hope that you and the family will make it there too, the kids will especially love it. Enjoy your time in Mexico! Everything was as you related or as other commentators updated. We traveled with a 15 y.o., 13 y.o. and 9 y.o. We went through Muyil first (still $50P per person) and forgot to get a ticket to prove we paid but that wasn’t a problem on returning. The observation deck had a few people waiting and it’s five at a time so we opted to go up on our way back. The observation deck gives you a great view of the lagoon but it is a steep climb, and very open on the sides so young ones probably shouldn’t be climbing or should have an adult stay close to them as they climb and when they’re on top. There is now someone who works for the park who will put you on a wait list and set you up with a guide whose boat can accomodate your party or add you to other parties on his boat. He was very friendly and the initial wait for us was 50 minutes. We were given a guide much sooner and it was just our family of five. The charge was $700P p/p and $500P for our 9 y.o. You’re guided through one large lagoon, through a mangrove river and then another lagoon that leads you to the mangrove river that you can swim or snorkel in. Once at the dock, our guide, Carlos, collected our shoes and put it in a dry bag and floated with us (quite patiently) as we spotted fish. The water was freshwater and clear and it was like floating in a natural lazy river. So worth the Pesos. The shoes are necessary because you will have to stop at the next dock after about a 30 minute float and walk back along the boardwalk. There is a small ruin at the dock that you can look at before you go. If your guide doesn’t bring your shoes along in a dry bag, make sure you strap them on you or wear it on the float. We left the rest of our stuff on the boat and had no problems. If you have younger kids, or have a limited amount of time (or had your fill of ruins as ours did), I would suggest skipping Muyil and go straight to the parking lot that leads to the dock. We brought a lunch or heavy snack as we had a late start. The only food place I observed across the street was closed by the time we got back (around 3:30) to the Muyil parking lot so it’s wise to bring something to eat. Hello! Thank you for your informative post! I visited Sian Ka’an this morning via Muyil. My only update was it cost me $45 pesos to access the ruins but well worth it. I had the place to myself and really enjoyed wondering around what felt like a park without feeling pressured to get out of the way of a thousand tourists!! Was a great way to spend the morning! Thanks again!! Thanks so much for the update about the slight increase in pesos on the ruins! 🙂 Will edit this post again to reflect that. Yes, isn’t it awesome to have those ruins all to yourself? Such a more tranquil experience than the hoards at Tulum and Chichen Itza. Glad to hear you enjoyed! Thank you for such a detailed account! My husband and I followed your guide for our own experience this week. Only update for Feb. 2018 is that the price of admission for the ruins has increased to $45 MX per person. Otherwise everything is still up to date and so helpful for a “build your own” tour! Thanks for the update Becca! We hope that you’re enjoying your time in beautiful Mexico! Thank you for your informative post! We are in Tulum now, and planning to do Sian Ka-an one day, via Muyil. We hope to be able to bring our our inflatable SUPs (Standup Paddle boards), and SUP rather than speed boat. I hope that is allowed – haven’t been able to find anything on the web suggesting that wouldn’t be allowed. If you have any knowledge of that, we’d appreciate it. Otherwise, we’ll be giving it a try in a few days. Wish us luck! Good luck! Honestly have no idea. Sounds like an interesting pursuit! I would imagine it may be possible. I don’t think there’s any laws forbidding it or anything. But really don’t know. Would be awesome if you could report back your experience. Best of luck! Thank you for this thorough and helpful description!!!!! My husband and I visited Sian Ka’an last week and followed your directions to the letter. It was all exactly as you’d said it would be, even the price of the boat ride! We really wanted to experience Sian Ka’an on our own, without a guide, and I didn’t think that would be possible until I read your post. From the bottom of my heart, thank you for this helpful info! Always glad to hear this post is continuing to help travelers! 🙂 Thanks so much for popping back by to confirm costs and let us know. Hope you had a wonderful trip to Mexico! We were so grateful to find this post before our recent visit to Tulum. It was definitely a highlight of the trip! Our costs were very consistent with recent comments. 28 for adults for the one-way ADO bus trip. The kids were half-price. We were able to get a slightly reduced-price boat tour for our nine-year old. The return collectivo was 40 pesos per person. The boat tour operation was more professional that we expected from our initial read of the post. The captains/guides had uniforms and official biosphere wristbands. We had our snorkel masks with us, which made the float more interesting for the kids. Great article, thanks so much! When we went to the bus station, they didn’t have an option to go by bus, but steered us to the collectivos at 70 pesos each, one way. It was a fantastic experience, especially the float. The only snafu was getting back. The collectivo goes well past Muyil, and if it’s full on the way back, it won’t stop. Same problem with taxis. We did see one ancient tour coach pull over going outbound, but it didn’t look like a public bus; none came on our side of the road. So we hitched a ride with some people exiting the ruins into the parking lot. Hmm, strange to hear about the bus. Thanks for the feedback. There have been regular buses plying that route for some time. But glad you got the colectivo and were able to hitch a ride back. And yes, the cost of t he boat tour is 700 pesos. Thanks for the information! It was helpful as ”official” information as it is difficult to get on the net. We are a family of four and we did the ”tour” today. We drove down to the boat ramp and was assured we´d get at boat in an hour. We drove back to the ruins and parked and then walked to the boat ramp on the board walk. We got our boat on time and then did the boat tour, the swim in the canals, the walk back and then back to the boat ramp. We all had a good time and a good experience although it was quite a lot of people today. Again, thanks for the information – it was very helpful! So glad hear you had a good time! 🙂 I imagine it’s likely more crowded than the norm around the holidays. It was nearly empty during our last visit in late-January. Thanks so much for stopping back by our blog to share your experience. Enjoy the rest of your trip! My husband and I just returned from Mexico and used this write-up to DIY a trip to the Sian Ka’an Reserve. We had a rental car, parked at km 205 at entrance to Muyil where we paid 40 pesos each for the ruins and were able to use bathrooms. The ruins were interesting and had good tree coverage to keep cool. Signs, maps, descriptions of what you were looking at were limited and no guides available to explain, but well worth $3 for a jungle walk and self-guided tour of the small site. We then did the boardwalk with the observation tower, another 50 pesos each. Path ended at the parking lot for the boat ramp. We requested entrance for 2 and were told it would be 700 pesos and that we’d have to wait for an open boat between tour groups. We waited about 15 minutes at which time a different park official came over to give us wristbands. He said it was 700 pesos, we said ok and gave him 1400 (2 500s and 2 200s), he then gave a 200 peso bill right back to us. So, we paid only 600 pesos each, but believe it was his counting error, so we can confirm the price of 700 pesos each as stated by 2 separate park officials. There really wasn’t much of a tour once on the boat. The guide drove quickly across a large lagoon, through a short canal, and across another smaller lagoon before entering the float canal. He parked, we jumped out, floated for ~40 minutes, and at the end the guide was waiting with our shoes from the boat where you then have a 10-15 minute walk across a boardwalk back to the boat (and your towel/clothes). The float was incredibly relaxing and a really unique experience in crystal clear freshwater. We had goggles and snorkels, but only saw a handful of fish – not worth bringing the gear. I suspect the increased traffic has pushed the fish to hang elsewhere. This was worth it once, not sure I’d pay $35 to do it more than once. Today Dec 23rd 2017: boat trip was 700 pesos. Place was packed. No negotiation. Lovely trip- Thx for info. Bus to muyil 28 per person. Return was 80 for 4 people in a taxi heading back to tulum (bargain). The collectivos (mini buses) charge 40 per person. Just stand outside the park entrance and you’ll get a ride. Hey you guys, thanks for this amazing post! We just came across your blogpost as we are heading to Mexico in a couple of days! We will definitely keep your recommendation in mind and are sure to enjoy sian kaan! We will let you know when there are any changes regarding the prices. Great! Hope you have/had a great trip to visit Muyil and Sian Ka’an! Guys, thank you so much for this detailed description of DIY tour to Sian Kaan! It was very helpful and everything worked as you described. The boat trip is really overpriced (compared to other trips we did in Mexiko: flamingo tour in Celestun – 2000 M$ / 8 persons on the boat or Canon de Sumidero 200 M$ per person), but thanks to your blog post, we were ready to pay such price and we have to admit that we really enjoyed the trip and especially the long floating part! We tried to negotiate the price for the boat but the guys were pretty strict. Thanks once more for the post and take care! Hello! We cannot wait to visit Sian Ka’an in a week! I have a couple questions I hope someone can help with. How much time should we allow, start to finish? We would like to potentially explore the ruins as well as do the lazy river. Is the boat ride two hours each way or does it take two hours total for the boat and the lazy river float. I’d plan for about a half day total. The boat ride is about 2 hours, including time floating in the canal. 30 minutes would be ample time to see the ruins and another 30 minutes or so for the boardwalk and tower. That’s just a rough estimate. Some people may go faster or slower. Hope that helps and you have a great trip! Thank you for this great advice! I m eager to do it that way when I head to Tulum again. We hope you have a great time visiting Sian Ka’an! It’s a fun place to journey out to! Thanks for your great post! I’m a solo traveler woman traveling to Riviera Maya next month. I would love to try your DIY trip to Sian Ka’an Reserve but as a solo traveler can I expect to pay more for the boat? Is it safe? Can I join an other group on the boat? Should I not bother and take a tour instead? Hi and sorry for the delayed reply as we’ve been traveling with limited Internet. Hopefully this may have reached you before your trip. You won’t have to pay more for the boat trip, as the price is per person. The only trouble is that it could be possible that the boatsman may not find it worthwhile to take a single person. I’ve heard reports of other solo travelers going on a private boat trip all on their own just fine, and have heard other reports of the boatsmen not wanting to take a solo traveler. You can definitely join another group if you happen to be there around the same time as others. And yes, it is safe. It’s definitely possible to on your own, solo. But for more of a sure bet, I’d recommend trying to find another traveler to pursue this with or perhaps considering a tour. Just wanted to thank you John for this write up. The instructions work just as well now as they did when you first wrote them for the Muyil ruins, jungle plus speedboat/mangrove tour.. My family visited and enjoyed the trip immensely, it was one of our highlights. Allow around 3 hours for the trip, from arriving at the ruins. You cannot sail alone – we helped a solo traveller out by allowing her to join our boat. So if you are heading down there alone – or maybe even in a group of two – you may need to buddy up with others and/or hang around until other solo travellers arrive. There is not much to the Muyil ruins, so dont go thinking you’ll spend an hour or more there. More like 20-30 mins. There are toilets at the entrance to the Muyil ruins and crucially – once you exit the jungle and reach the boats. This means you can use the loo on arrival and departure from speedboat/lagoon trip. The jungle section is cool, well worth the extra pesos – especially the observation tower! Don’t go expecting much nature other than some fishing on the Muyil trip, though do take a snorkel if you can! Take more water than you think you’ll need. There are small shops on the road at the entrance to the ruins, but nothing beyond there. Take more mosquito spray thank you think you’ll need if you do the jungle section, the mosquitoes are many and hungry! (avoid deet as it is poisonous to wildlife). Take a waterproof bag for anything you wouldnt want to leave unattended for an hour. Although the guides are many and I found them to be very trustworthy, to avoid any problems, bear in mind you will be expected to leave bags unattended, therefore either dont take anything valuable with you, or have a waterproof small bag you can put round your neck or something. FWIW – I left my wallet in my satchel with cash, credit cards, driving license, you name it.. it was fine, but, dont put yourself in that situation. So glad to hear it helped and it turned out to be a highlight! Thank you so much for the updated and extra info you’ve provided here. I think these comments have evolved into a helpful group forum to keep this all up-to-date and helping other travelers make it to this special place. So thanks again for the added input! Those are great points about solo travelers and the toilets! Went to Sian Ka’an this week and your write-up was invaluable to us as far as working it via DIY. We really wanted to have everything set up in advance as the drive was a significant investment. My desire was to do the Punta Allen tour as that would involve more marine life but found it difficult to get around the ecotour mafia that has relationship with the boats. I was able to directly contact a boat operator for the tour from Muyil but he was charging off his website 700 pesos. Continuing to persevere on the Punta Allen angle, we reached out to a hotel operator who for a nominal fee after much wheedling booked a boat for us and allowed us to use their property for changing and relaxing for 150 pesos. We got the exact tour that people pay for anywhere from 115 to 150 dollars for 600 pesos per person for a group of five or roughly 170 dollars total. We first went to see the dolphins frolicking, then to the sea turtle habitat (saw only one), went snorkeling at a gorgeous reef for about an hour, and wrapped up swimming in a shallow lagoon for just about three hours total on the water. The snorkeling was at a very heathy reef and was the highlight with lots of coral and fish. The drive out was about 1.45 hours from the entrance to the biosphere, as the tropical storm from the week before has done a number on the road with lots of potholes but was quite doable. Saw two crocs at the bridge and even though it was a long day, it was definitely the highlight of the trip and felt all that more meaningful as we did it all on our own. Wow, that sounds awesome and a great deal too! I’m determined to visit the Punta Allen side during our next trip to the Yucatan and your account is very encouraging to pursue. Thank you for reporting how a DIY trip to Punta Allen is doable – very cool! I am interested in doing the Punta Allen tour as well and would love any additional information you have on setting up a similar deal to what you acquired. Do you by chance remember the name of the hotel or where you provided any contact information for the boat captain or operator? I am a bit hesitant to give out a name as the booking was more of a favor then anything else. That was why we paid for using the premises because otherwise this individual did all the work of getting us connected with an operator for free. I will tell you there aren’t many lodgings in Punta Allen so with a little research you can figure out who may be able to connect you with an operator. If you plan on sleeping there then they’ll easily take care of it for you. I would recommend that at the start, mention you’ll pay a fee in advance for booking the tour. Thank you SO MUCH for this detailed post. I felt confident to go at it alone after this, and a girl from my hostel joined. Unfortunately the colectivo tried to rip us of and overcharge, so we took a Mayab bus which was 28 pesos and took some time to arrive, we waited 50 minutes instead of the promised 5 (I only just got here, it’s probably normal they do that) We skipped the ruins and went straight to the boat area where the guys welcomed us with open arms. 600 pesos is still what they charge, and all the compliments are for free. My friend gave him 650 pesos by accident (she paid with lots of notes) and the guy promptly gave her the 50 back, stating he thinks it’s important to respect us. I felt they were very honest people. We ended up being added to a group of German tourists which was somewhat of a bummer, but the floating bit lasted for a very long time and was a lot of fun. I still think 600 pesos is expensive, but we had a nice morning and I took some cool pictures. The guys told us we could backtrack and visit the watchtower without paying the 50 pesos because there is no one to charge it. We obviously took their advice. The food stands on the other side of the road served quite good food and were very cheap! It was a popular place for Mexicans to stop and have a snack. Going back to town it was very easy to hail a colectivo and this one just charged us 30 pesos luckily. A successful day, thanks again! Thanks for stopping back in and sharing your experience! Sorry the colectivo there didn’t work out but glad that you ultimately made it! 🙂 The ADO buses worked well when we were last there. Yes, the boat guys seem very honest and thanks for sharing your story that very much illustrates that. It’s refreshing to hear! We agree that 600-pesos is a bit pricey by Mexico standards but also thought it was worth it for the great experience. That’s interesting to hear you saved a few pesos by backtracking to the watch tower. I would have thought they may check your ticket. And thanks for the recommendation about the food stands across the street – very good to know! Hoping to do this tomorrow. Does anyone know if we could take a detour and catch some manatees? You will be more likely to see manatees in the bays around the ocean side rather than inland around Muyil. Manatees are known to frequent the Boca Paila lagoon area and Ascension Bay, which are in a different location/road than the Muyil departure point that is chiefly described in this post. If you have your heart set on seeing a manatee, you may want to consider heading towards Punta Allen instead. Good luck! Thanks so much for this post. It really helped guide us on our trip to Sian Ka’an this week. We try to avoid group tours at all costs and decided to go the DIY route to Punta Allen for the boat tour. A new Mexican friend recommended a taxi driver who would arrange everything in advance and take us there. And you’re right, while the road is incredibly bumpy and full of pot holes, it is by no means impassable or the worst road we’ve driven. The highway in Costa Rica was by far worse! I wouldn’t let the road deter anyone from taking this trip. From our hotel on the beach in Tulum, travel time was 2 hours. We stopped to sight-see on a bridge over an inlet where the ocean and the lagoon meet. We saw barracuda in the water, but no crocs or manatee. Our driver had pre-arranged a boat for us in Punta Allen and we had a private two-person tour with a knowledgeable young captain who was happy to share his home with us. The lagoon is HUGE and very calm waters. We went to an island and saw frigate birds nesting and newly hatched chicks, we followed a family of 5 dolphins who were only too happy to perform tricks for us in the water. We saw huge sea turtles, snorkeled the barrier reef and swam in coke-bottle colored clear water. At the end of the three hour trip, our captain dropped us off back in Punta Allen where a fresh grilled lobster lunch and cold beer awaited us. We paid $160 USD per person (plus tips), which is on the high side, but worth it for the convenience and privacy. That included everything. Park admission, boat tour, snacks and beer on the boat, and lobster lunch. A definite highlight of our trip! Glad to hear this post helped and thank you for sharing your experience – that sounds like a great time! So awesome you got to see turtles and an impromptu dolphin show. The snorkeling sounds amazing too and how great that it all culminated in a lobster lunch! It does seem a bit pricey by Mexico standards, yet perhaps well worth it for all that is included and the great experiences/memories. Small group tours with a similar itinerary to Punta Allen run about $140 from Tulum, so your taxi/tour is certainly in line with that pricing. Not bad at all, for a few bucks more for a more private, intimate experience even being invited into a local home. Sounds like a fantastic day!! Hi Charlotte, we’re so glad to hear this guide was useful. And thank you for confirming the prices! Interesting to hear about the collectivos too – that’s good to know. Sounds like a good alternative to the ADO bus if one isn’t departing soon. All the best on your continued travels! Thank you so much! We followed your post and it was perfect – we are travelling for a few months and are on a budget, so this was exactly what we were looking for. Prices are $40 pesos per person for main entrance, $50 pesos per person for the boardwalk park, and $600 pesos per person for the boat ride (this was on May 31). Great write up! I will be printing this out for our trip next week. Question: how much time does it take to see the ruins? How long does it take to float down the canal, too? I’m debating if I should see the ruins or skip it since I’ll have a 3-year-old and an 8mo old with me… thanks in advance! For the Muyil ruins, it all depends on your preference. You could easily breeze through the ruins in 5-10 minutes or linger for over an hour. I would guess that most people spend about 20-30 minutes exploring Muyil. The canal float takes about 20 minutes. You could opt out of the canal float if you needed to care for your little ones, but I’d strongly recommend trying to do the canal float as it tends to be a favorite experience of this trip. Fantastic day just following yours directions! Merci beaucoup!!! Prices are still correct. If you are around 1.00 pm there is local bringing food at the dock to the guide and we enjoyed one of the best lunch of the day. So glade you posted this so we could enjoy it too. Thanks for the comment and sharing your tip with our readers about the lunch service! Glad to hear you had an enjoyable day at the Sian Ka’an. We just came back for the trip. We have a rented car so we didn’t use the bus. We agree that the boat trip is amazing and well worth the cost. Thanks for the comment. We’re so happy to hear that you enjoyed your boat trip in the Sian Ka’an Biosphere Reserve! Thanks John we had a great trip – everything accurate and prices still the same. Thanks so much for the comment and providing an update to our readers. Glad to hear you had a great trip in the beautiful reserve! Another thanks from our little group for this nice description! As Jasmine said it’s still 600$, plus 50$ for the observation tower and 40$ for the ruins. 30$ for the collectivo and 28$ for ado bus, one way. But I would like to add another very interesting suggestion to everyone. We are long term travellers on a low budget and thought that 600pesos for this boat ride was a little pricey for what it is and the work and gasoline they put into it. Also the wildlife is pretty unexciting. But they also offer someother boat tour from the lagune. You basically do the same thing (muyil ruins, observation tower and the floating). But then after the floating you could go to the next lagune and check for crocodiles, manatees and other wildlife. This whole tour would cost only a little bit more if you are enough people (preferably six). Because with this tour you pay by boat 4300$, which is around 200usd I suppose. If you are six people, you pay more or less 720$ per person. So only a little more for getting the chance to see some awesome animals! Problem for us was that we were not enough people and didn’t know about this option in advance. We looked for more people to join at the lagoon, but they saw it and said that they don’t mix up groups. So you need to find the people in advance, best in your hostel, or maybe still at the ruins and pretend you are one group together. Thanks for the comment and sharing your experience and opinion with our readers. Was there a way you were able to differentiate the tour providers offering the different tour you mentioned from the traditional tour? Good to know that a secondary boat tour is an option as well. Just wanted to say thank you for this guide as my husband and I followed it to make the trip to Sian Ka’an today on our own. I’m not sure how it was like when you were there, but there is now a small hut next to the observatory tower where the boatmen gather, and it appears as though it’s a collective rather than individually run boats. They had radios/walkie talkies. Anyway, I’m not sure if it’s because it’s a Saturday, or if the place is more known now, or we just happened to arrive when there was a crowd, but we arrived at about 1220 to be told that the next available boat was at 1340. My husband was a bit annoyed but we decided to wait since we got all the way there, so we sat enjoying the breeze and had some coconut ice cream (there was a man with a cart). Thankfully at about 1240 they told us they could take us, so off we went! We were on a boat with another couple, but there was another boat with 6 other tourists so there was a little noise as we floated along the canal. Still, the place is beautiful and the floating part was fun! We brought our snorkels/masks as you suggested and saw some fish, but unfortunately that was just about the wildlife we saw. For future visitors, the boat trip is still 600 pesos per person, the bus trip there & back was 56 pesos per person (return). This might be a silly question- do we have to worry about crocs in the water? Hey Gina, thanks for the question. I too occasionally get sea sick and had no trouble on this trip. It’s a small boat over very calm water. There’s only one route from the Muyil entrance, and I recall it being about a few hours. Thanks! … just to clarify… the boat ride to Sian Kann is a few hours by boat?? Hey Gina, sorry for the confusion. I was referring to the boat ride around the Sian Ka’an biosphere reserve. You two are great! Thanks for the time and effort. So nice to have options. My husband is a fly fisherman and we were wondering if there was a way to combine your DIY float trip with renting a boat at the end of the float to fish in the ocean (catch and release of course). Do you know if there are boats at the end to rent to explore the ocean area and if so, do you need a pass to use the ocean part of the reserve? Also, any clue where to get a fishing license? Muchos Gracias!!! Hey Suzan, thanks for the comment and question. I don’t recollect seeing any fishermen while visiting the biosphere reserve. The only few boats we saw were from the men providing the tours. Unfortunately, I’m not familiar with the logistics involved with getting a fishing license. I’d recommend the best place to start would be to contact one of the fishing charters in Tulum. Good luck! Thank you so much for this article! Spot on! Our visit to the Muyil Ruins was hands-down the highlight of our stay in the Tulum area. As a couple we paid exactly 1500 pesos ($75.00 USD) for the whole adventure including a tip for the boat guide. I will presume these guys get paid well for what they do, and likewise are very trustworthy. We felt more than safe leaving our belongings on the boat. The boat guide even carried our shoes to us after the float for the walk back on the boardwalk, much appreciated. Looking back, I really wish I would have brought water shoes, snorkel gear, and a waterproof case my phone to capture the awesomeness of this adventure – all stated in your tips. In town we saw many vendors selling all of these items for cheap. This place is not crowded at all, we may be encountered 20 people the whole morning. I would say 4 hours is accurate for the length of time it takes to explore everything here. We got there at 8:00 and were back to our car at 12:00. Plenty of time to grab lunch and hit a Cenote afterwards. You have done us a great service and we owe you dearly for this incredibly well written, detailed, DIY guide. Thank you! Hey Zeke, thanks so much for the comment. We really appreciate you sharing your experience with our readers. We’re thrilled to hear that your day trip was a highlight while in Tulum! We’re hoping to get back there one day, it really is an incredible place to visit. Thank you. Had we not found this fantastic article, we would never have figured out how to visit Sian Ka’an on our own. Every detail was spot on. The price remains $33 per person and was well worth it. Unfortunately, we picked the cloudiest and coldest morning of our trip, but the canal float was still worth the chill! We’re always so glad to hear that it has helped other travelers find their way to Sian Kaan! Thanks so much for dropping by to let us know and reconfirm pricing. It’s funny to think of the Yucatan as chilly but I know the temps do drop every once in a while. Hey, at least that helps to keep the mosquitos away! 🙂 Glad you found the chill to be worth it, and that will likely be helpful to others (like the previous commenter). So thanks! We are in Tulum and considering doing this trip. My one concern is the water temperature. It’s been on the cooler side this week and I get easily cold in the water. Thanks for any help! Hi Wendy, my advice: test the ocean water in Tulum and use that as your gauge, as the water in the reserve will be a similar temperature. My wife gets cold very easily and hates cold water (we’re from Florida after all). But she was fine with the temps swimming around in Sian Kaan. We just came back from Sian Ka’an with our three girls (12,9,6 years old) and we had the best time! Followed your directions exactly by driving to Muyil from Tulum. The prices were exactly as explained and managed to have a wonderful time and experience for a little less than $150 USD for all five of us! Thank you!! Hi Kara, thank you so much for the comment! We’re thrilled to hear you and your family enjoyed Sian Ka’an! We can’t thank you enough for this very detailed information! So difficult to find out any of this stuff from the locals. We’re off to Sian Ka’an tomorrow and feel much more confident about how to get the best out of our visit now that we have read your guide. You have done a great service to independent travellers in this little corner of Mexico – many thanks! Hey Marice, thanks so much for the comment! I hope you enjoyed the Sian Ka’an as much as we did! Yes, thanks we had a great trip – your report was so detailed and faultless that we managed it with no hassles, and we picked up a tip for a guide from trip advisor, where we found the details of Pastor, who is one of the regular boatmen. He has been guiding there for 12 years. He speaks fluent Spanish and English, and he trained under a UNESCO scheme to learn all about the flora and fauna of the lagoon, a knowledge he is eager to share. His email is pastorcaamal@gmail.com. He answered our email within a couple of hours ( I guess after his working day finished) and offered us a 2hr trip round the lagoon, incorporating the down-river float, at either 9am, 12pm or 2pm, or a 4hr trip taking in the Muyil ruins and some of the surrounding jungle in addition, starting at either 9am or 1pm. The costs were 600 pesos per person and 900 pesos per person respectively. We chose the former, at 12pm, as we were confident that your report would enable us to visit the ruins and jungle without a guide. Pastor turned up to meet us on the dock at 11.55 and initially it looked like we were going to be just the three of us, but then just as we were leaving another four people turned up so we had what I think is the maximum boatload of 7 persons. In retrospect I think perhaps we should have chosen the earlier or later tour, because there was not much wildlife about in the heat of midday. However we did see a few interesting birds – local eagles, giant egrets, an osprey and a stork are the ones I remember – and in truth the experience of coasting through the lagoons and floating down the creek was more than worthwhile. We left our belongings in the boat while we did the floating, which lasted about 40 minutes. Pastor had assured us they would be safe. We had assumed that he would be staying in the boat all the time, but in fact he met us at the other end of the float, bringing our shoes, having walked round on the boardwalks which traverse the lagoon creeks. He then escorted us back along the boardwalks to the boat , imparting gems of knowledge about the surrounding flora en route. This took about 30 minutes, and, while it was very interesting to learn more about the indigenous plants, I was slightly nervous that our belongings, having been left untended for at least half an hour, might not be intact when we got back to the boat! However my fears were groundless and when we reached the boat again everything was exactly as we had left it. During the boat trip back across the lagoon to the dock Pastor made a couple of detours to get a closer look at some of the birds we spotted, and we arrived back at the dock about 2.15 pm. We then followed your directions to the ruins and spent a happy half hour or so enjoying the peace and tranquility of the site, where we did not see another soul. We then waited at the bus stop for about 15 minutes when we spotted an approaching collectivo ( I think you call them ‘Combis’ ? ) which we flagged down and they told us the fare into town would be 30 pesos each. I think this was a ‘tourist’ fare rather than a ‘locals’ fare, but we were happy to accept that price as we weren’t confident that the bus would be along any time soon. Ironically, the bus hove into view just as we were boarding the collectivo! All in all we had a great trip, and would recommend the do-it-yourself approach hands down – especially as Pastor told us that he is often engaged by the travel agencies who offer the heftily priced all-in day trips, and the boat tour he gives to their groups is exactly the same as the one we had. It should be pointed out, however, that Pastor works exclusively on the lagoon side, so if you wanted to see anything of the ocean side, with its different flora and fauna, I suspect you would have to go through one of the agencies and pay the 139 dollars we were quoted by a couple of them! Once again, thanks so much for your wonderful post – without you we would not have attempted what turned out to be one of the most enjoyable trips of our vacation! Thank you for your article ! It was so helpful for us, because we didn’t want to pay too much for this excursion ! We’ve done it yesterday, and it was really amazing ! Unfortunately, our captain didn’t speak English so we didn’t have any informations about the reserve during the boat tour. We think to write an article in french about this experience, to help french travelers ! 😉 And we will take some information from your article, that we will mention in our. So glad to hear this was helpful! I think it’s hit or miss whether the boat captains speak English. Some of them do and others don’t. Most of the boat men are there as boat drivers, rather than true “guides” that give you detailed info about Sian Kaan. Still, it seems there are a few who do speak English and provide more of a proper tour but it’s luck of the draw. Glad to know that this info will make it’s way to French speakers too. Merci! Thanks for the price confirmations! And glad to hear that you were able to negotiate down a bit. There does seem to be tiny bit of wiggle room possible to negotiate with larger groups. Great to hear you were able to shave off 500 pesos! Hi and thanks for your DIY-tips! We did the ruins and boat tour yesterday and it was great! We had our kids with us, 3 and 5 years. I can confirm the prices, 40 pesos for adults free for kids (ruins) and 600/300 pesos for the boat. Our guide Jaime (or James, as he wanted us to call him) was completely trustworthy and spoke really good English. I would like to add that there are restrooms both at the ruins and at the boat dock. A bit simple at the dock perhaps, but good enough. Thanks for this post. It was exactly what we were looking for this week! It is an easy drive from Tulum to the Muyil entrance. Guides are relaxed and seem very trustworthy wrt to leaving your bags in the boat, so no worries about that. Guides told us they have strict rules. Price was still 600 pesos pp. Excelente publicación sobre sian kaan, gracias por los tips! Thank you very much, first time i heard about those DIY initials and it is so much useful! Everything went as said. The guide we had was wearing a teeshirt from community tours. I asked him about crocodiles, he told me they don’t appear in the floating area much more on the ocean shore. Hi Kimy, thanks so much for the comment and sharing that your DIY experience went smoothly! Hi Zoe! Thank you so much for the comment and letting us know you found our information helpful. We’re delighted to hear that you and your husband enjoyed the Sian Ka’an Biosphere reserve! Hello! I MUST say, “Thank you very much for all the information you’ve posted! !” We are going to the Cancun area next month (our 2nd time). We skipped Sian Ka’an last time because of the $$$ price. We are a group of 6, 3-generation family trip:) And as you said, I have found NO information as to how to get there in a DIY way EXCEPT FOR yours!! Thank you very much again, and I will sure update after completing the trip. Hi, thank you so much for this great info! We are heading down there in a few days, and it will be ou first trip without guided tours. We are planning to drive; do you know how far it is from the end of the canal float back to the parking lot? So glad you found it helpful! After the canal float, you’ll the boat takes you back to the boat docks near Muyil. Once you return to the boat docks, it’s a 1 km walk (10-15 minutes) back to where your car is parked in Muyil. You can either walk back on the nature trail using the same way you came from Muyil or for a more direct route, just walk up the dirt road which will take you back to 307 (about a 10 minute walk). Make a right on 307 and walk North for just a couple minutes and you’ll be back at the Muyil parking lot. Have a great time! Question for anyone. We have 2 children 7 and 11. We are flying out Saturday and plan on doing this tour sometime next week. One thing I’ve heard no mention of is presence of alligators or crocodiles in the preserve. We are from Florida and one would never think of “floating’ in a lagoon here due to fear of alligators. Are there none there? I’m very cautious because of my children. thanks for any info on this. 🙂 We plan on replicating this itinerary when we’re there. There are saltwater crocodiles that live in ocean side but to the best of my knowledge they do not come into the clear fresh waters that the boat tours pass through. I’ve never heard of any croc sitings in that area at all. And during our last float trip, I asked the guide about sharks and crocs and he just laughed and said they don’t come here at all. We’re also from Florida and while I’d never feel comfortable swimming in Central Florida lakes, I felt fine in these clear waters. That all said, I am certainly not a wildlife expert of Sian Ka’an and hence would have to defer to someone that is to give you absolutely certainty of any croc risks of this specific area. Interesting to hear that you were able to haggle them down a bit. They’ve always seemed to have held VERY firm on the price of 600 pesos per person. Perhaps you had some children in your party? (They’re usually negotiable) Either way, glad to hear you got the price down a but, and happy to hear you enjoyed the Sian Ka’an and the recommendations proved helpful. Cheers! Great article, thanks for writing all this up! Judging by all the comments, I’m sure you can tell how helpful it is! I’m going in August; I plan on doing the Muyil route and packing lunch and spending a goo chunk of time at Sian Ka’an. We’re hoping to see plenty of animals, if so, I’m sure it will end up being the highlight of my son’s trip! Questions: What time of day do you recommend going to the Sian Ka’an? And does the reserve have specific opening and closing hours? Where are the best areas for wildlife? Thanks! August will be very hot so I’d recommend trying to go as early in the morning as possible. That may also help to avoid any afternoon thunderstorms that may pop up. Muyil opens at 8:00 am and there are no official hours for the boat guys at Sian Ka’an but I’d imagine you’ll find someone to take you out during the times Muyil is open. As for animals, there’s a lot of luck involved there and I wouldn’t get your hopes up too much. On the boat trip of the Muyil route, we’ve only seen birds, fish, and crabs in the water. Still, it’s a great trip and hopefully you and your son will enjoy very much. Have a great trip to Mexico! Thanks for posting your report. We used it as a reference point and visited Muyil. it was a great experience. As of 1 June, 2016, we paid 600 per adult, 500 for two kids (11 and 14) and 300 for our 4 year old. 2500 pesos total. It took less than 5 minutes to say we wanted to go on a boat tour and to get going. We joined another group but that was no problem. They also had a life vest for the 4 year old. Great experience. It was worth the drive. So glad to hear this was helpful and thank you for returning to our site to provide an update. It’s always interesting to hear the pricing for the children, since we have no experience there. Nice to know they had a life vest for the 4 year old and happy to hear you had a great experience! Thank you so much for sharing your experience! I have a friend who used this as his guide and recommended it to me for my trip to the Riviera in July. I have one question – I am going on this trip with a large family, and we may have more than 6 people interested in joining this part. Were there several or at least 2 boats ready to go when you arrived there? And did you get a sense that they might overlap the trips so that it would be possible for us to do the float through the canals together (let’s say, if like 10 people wanted to do it together)? I know you might not be able to say for sure, but it would be helpful to know if there were several boats waiting to take people, or if there were just 2 (in which case lowers our chances of having 2 boats ready to take us). Glad you found our site and this guide has proved helpful! I cannot say with certainty that there will be multiple boats ready to go, but I would say that it is very likely. If not, I’d imagine that they could probably call someone else to come. During our last visit, there were at least a half dozen boatmen just waiting there. Organizing two boats at once to do the canal float together, I wouldn’t think would be the problem at all. Hope it works out! Report back if you can to let us know. Have a great trip to Mexico! We did the “DIY Sian Ka’an tour” on april 10th 2016. We really appreciate all of the given information on this site. The tour was really awful. Thanks for the update and confirmation on the pricing. Did it today, got the exact same prices. I would only add that the Mayab bus to/from Playa del Carmen is 68 pesos. Thank you for confirming the prices and adding the bus info to get to Muyil / Sian Kaan from Playa del Carmen. Very helpful! This is an amazing contribution to the DIY travelers! I have been travelling central america for the past couple of years, and my experience in Mexico has been expensive and much more “packaged.” This article is super helpful, thank you for writing and sharing your experiences! My family is coming to visit, and we are going to do this day trip as you describe it; but I did have one question. If we drive and park outside of Muyil Ruins entrance, and then do the boat trip/float trip as you explain above, when we are done, will we be anywhere near our parked car? Is it going to be easy to get back to it? Thank you again! I am so excited about this day trip! Yes, it is easy to get back to your car from the boat dock area. You can go the reverse direction that you came through the boardwalk. Alternatively, for a more direct route, you can simply walk up the dirt road which will take about 5-10 minutes. And then just make a right to walk on the side of the road for another 2-3 minutes to get back to the parking lot at Muyil. In total it is about a 1 kilometer walk from the boat docks to the Muyil ruins car park. Great post, thank you for taking the time to provide such detailed information. We’re in Tulum area for a month, will add these stops to our list. Punta Allen sounds amazing though that road is intimidating. I really appreciate this article! Thanks a bunch! I will be attempting the same DIY adventure and will keep you posted! Always glad we could help a fellow traveler. Hope you have a great experience! We did this trip on March 23, 2016. Your directions and info are bang on. I think we paid 38 pesos each to enter the park and 50 pesos each to walk on the boardwalk. However, we discovered the road that leads out of the area after the boat tour. If you walk about 5 minutes you come out to the highway and walk another 5-10 minutes back to the park entrance. It’s the second “driveway” past and on the same side as the park. There’s a house with a large blue elevated water tank beside it. Turn onto that driveway that is actually a road. That’s the non paying road into the reserve that people park on to just take the boat tour and skip the ruins. Still 600 pesos for the boat ride for 2 1/2 hours including the 35 minute float. Be careful and listen for othe boats of tourists coming in the opposite direction in the canal. We were snorkelling and looked up and another boat was on us.All and all it was a good way to spend the day. The guided tours are very expensive. I would have been disappointed to pay a guide 260.00 USD for the same trip. Thanks for the great info. Yes, I know exactly the road you’re referring to. That’s exactly what we were referring to in the instructions to “Get directly to a boat to explore Sian Ka’an.” We liked visiting Muyil and the boardwalk but going directly to the boat docks is good for if it’s really hot, bug-infested, or anyone that just doesn’t want to walk. Yikes! That is scary to hear about boats coming up the canal that you float down. Thank you for alerting of us this. When we were there that canal seemed to be strictly for floating only and we walked back on a boardwalk to reconnect with our boat. I do hope that was some sort of rare occurrence, but if not, this is good to be aware of. Great article! Any idea if they will take a single person out on the boat for $600 pesos? Thanks!! Thank you so much for this blog. We never found the way to the boats through the Ruins but managed to find the gravel road. Unfortunately it was too windy to go for the boat ride but the board-walk and ruins were nice. Prices for adults are still fixed at 30 USD or 600 Pesos – turns out that children are negotiable however. Oh no, am sorry to hear you didn’t find the path. I just looked at your post and it seems that you did make it on the path from the reverse direction, so glad you were at least able to get there from the gravel road to walk on the board walk, go up the tower, and see the fishes. Thanks for confirming the price and very interesting to hear that children are negotiable! We hope that you are able to make it back there some day when it’s not so windy to experience the boat ride. Just took this trip today! Prices are all accurate. The entrance to the Ruins have indeed changed to 40 pesos/person. Everything was fantastic and directions were extensive and correct. Thank you for this great plan for travelers on a budget. Thanks for posting this guide. It was very helpful and spot-on in terms of buses, the boat and cost as of February 20, 2015. My girlfriend and I did this day trip from Tulum 2/20/16 and the overall cost was about $42, including boat ride, ADO bus back and forth. There is a Corona beer store next to the bus stop in Muyil which comes in handy if you wait for the bus. We bought beer, our bus showed up in about 20 seconds, so we had to wait to drink our beer later. Very nice trip, a real highlight of visiting the Tulum area. Thanks for the validation that the guide still remains to be helpful and accurate. And thanks for the Corona store recommendation. A cold beer in the heat of Mexico while waiting for the bus is always a great idea in my opinion! Cool video too! Cheers! I have tried for over5 yrs to get this type of information, 10 yrs traveling riveria maya. Not a person, taxi,local,or hotel knew a thing!! It is wonderful to have reached your site, I may yet get this off my bucket list yet….sounds wonderful. We never liked tours however are older and have been unsure lately wether to venture as we did when younger. We have some spanish and a little savy ,your article encouraged us to try. We are in plsya, akumal then tulum for a month ,so am excited we could try this. Thank you. Question. Do you know if it is possible to taje a boat to P A from akumal? Avoiding the rough road. Hi Denise, am so glad you found our site! Yes, we also found it peculiar strange that there wasn’t much information about Sian Ka’an and no one seemed to know anything about it in the area. So strange! That’s what prompted us to write this in the first place and we’re so happy to hear that it’s helping people to find this interesting place in the world. THANKS FOR THE AWESOME SPECIFIC DIRECTIONS. WE ARE GOING TO DO THIS WHEN WE ARE THERE IN APRIL, CANT WAIT! I AM ALSO LOVING TOUR ENTIRE BLOG,ABSOLUTELY FASCINATING, I SHARED IT WITH MY COLLEGE AGE DAUGHTER AND SHE IS HOPING TO REPLICATE SOME OF YOUR EXPERIENCES. That is so great to hear! We do hope the directions prove helpful and that you thoroughly enjoy Sian Ka’an when visiting in April. Also, we always love to inspire travel, so thanks for sharing our site with your daughter! It’s so nice to see parents supporting and encouraging travel. 🙂 Cheers to you! Dude, you ROCK! This was the best info for figuring out this trip. Just went today and entrance fee was 40 pesos per person, fee for sacbe boardwalk was 50 pesos per person and yep, boat was 600 pesos per person. Amazing experience. Nice! Thanks so much for stopping back by our site and for confirming the prices you paid. It seems the general consensus is the Muyil entrance is 40 pesos, rather than 50 now. So glad to hear you had an amazing experience! We’re so glad this helped. Today I found your website on my cell phone while on the beach in Tulum after snorkeling. My husband and I were trying to decide what to do for the afternoon. We wanted to go to Sian Ka’an but are always reluctant to join the masses on a tour. With your info we were on a boat within an hour. It couldn’t have been easier and is a highlight of our trip. Thanks so much! Hey Peggy! Thanks for letting us know. Ah, you gotta love this Internet age with info at your fingertips. So great to hear this post helped to make for a spontaneous afternoon trip to Sian Ka’an and it puts a smile on our faces to know it became a highlight! Cheers! We followed your instructions and had an amazing time in Sian Ka’an on January 1 2016. I surprised the members of our group with canal float, which everyone agreed was a highlight of our time in Mexico. We traveled with our 2 year old son, and he also loved the boat ride and canal float. Honestly, he loved Muyil as well (climbing and exploring where he could). The price was 600 pesos, but they did not charge us for the 2 year old. A word of warning to other parents about the lifejacket situation. Life jackets are required, and our boat had a child’s life jacket but not an infant life jacket. Fortunately we brought our own “puddle jumper” life jacket from home which worked great. Honestly, we used his lifejacket nearly every day in Mexico. Awesome! Isn’t the canal float great! Thank you for returning to our blog to confirm the instructions and the boat ride pricing. And thank you for proving this great added info for those traveling with a little guy! Good to know he got a free pass. Seems like that puddle jumper life jacket would be essential to bring on a trip to this area. Great idea and recommendation! This info is so useful! Thanks for sharing! We’re planning to go in March. We’ll drive to Muyil. Do you have the GPS coordinates to get there? Thanks! And for the boat docks (right around the corner), try: 20.0753187, -87.60781979. If you have a chance after your trip, stop back by the site to report back accuracy of these coordinates and I’ll perhaps add them to the post itself. Thanks for this article! Like many others, we followed your instructions and enjoyed it immensely. The canal float is the highlight of the experience, and they quoted us 600 pesos without asking. It was useful to know that was the going rate and gave us the confidence to do it. Speaking Spanish is really helpful; although the guides do speak English, I think that we got more out of the experience because we were able to speak in the guide’s native language (although for ours, his native language was actually Mayan). We did come from the Muyil side; it looked like some people may have come from the Punta Allen side and gone on to Muyil, but I am not entirely certain. Hi Elizabeth – Thanks for dropping by with this great feedback! Am glad to hear some consistency with the 600-peso pricing for the boat trip. We completely agree that the canal float is a highlight. Really a neat experience! Happy travels! Hey, Thanks for the great article. I plan to try this in 2+ weeks. We received notice as recently as last week from a reader who successfully embarked on the DIY trip to both Muyil and Sian Ka’an. If the tour group you’re using does, in fact, depart from the Punta Allen side as you suggest, then I could understand how it could be challenging to get to the Muyil ruins from there by boat via the lagoon side. 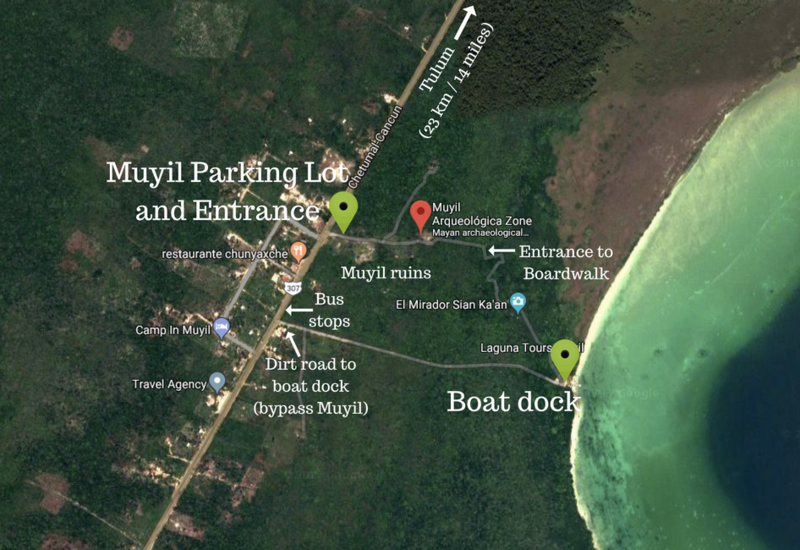 That said, any restrictions which may have been placed on entering Muyil from the lagoon, should have zero effect on the DIY plan reviewed in this post since you are accessing Muyil directly from land and then embarking on the lagoon boat trip. Hope that helps! Thanks! I’ll plan it, and research if there are any centoes near by as a backup plan :-). I’ll updated everyone here if infact there is a very recent restriction. And thanks again for all the valuable information you’ve posted for everyone! Great! We’re hoping you find no restrictions and you have an awesome excursion into Muyil and Sian Ka’an. Will definitely appreciate it if you stop back by here to confirm this after your experience. Thanks for the heads-up. Have a great trip to Mexico! Echoing all above. thank you so much for the great suggestions. We followed your advice and just loved Sian Ka’An. We so appreciate you putting the puzzle pieces together for us! Yay! It really makes us happy to hear this post is continuing to help people reach this awesome place in the world. Thanks for stopping by to let us know! Thanks a lot for your advice! Exactly what I was looking for. We are doing this trip tomorrow, looking forward to it! So glad to hear this was helpful! Hope you had a wonderful time enjoying Sian Ka’an! Hi, just wanted to thank you for this post- it was so on point. My friend and I had the same experience in that our hotel wanted to sell us expensive day-long trips that included swimming with dolphins (no thanks!) We followed your suggestions to the letter and had one of the best experiences of our trip to Mexico. Keep up the good work! Thx so much for the response and advise! I’m comfortable doing DIY, as long as I know other people have been ahead of me, without too much problem. I just wasn’t sure if you were going to say we were crazy to go off on our own w out full language skills!!!! Super-useful write-up. We drove to Muyil, but otherwise followed your advice. Despite heavy Christmastime crowds, we were lucky to meet up with Candido – president of the Sian Ka’an tour guide operator coop – at the gates of Muyil, and he led us right to the boat ramp, where we paid $600 pesos each for the boat ride and float. Amazing adventure! So glad to hear you had a nice time and the advice was useful! Thanks for the report back and added confirmation on the $600 peso boat ride and float! Hi, love reading all this info you’ve inspired!! Will be in Akumal/Tulum area in Feb. someone told us to check out this huge park area, south of Tulum. Assuming they mean Sian Ka’an, lol! Would u advise doing the DIY version, if we don’t speak Spanish? Could we manage, w being polite and just a few words? If you’re fairly comfortable with traveling independently then I think you can manage to get by on the DIY version with some very minimal Spanish and a smile. You’ll simply need to be comfortable with buying the bus ticket (if traveling by bus) and then speaking with the boat men at Sian Ka’an. Funny enough, Spanish is not the boat men’s first language either. Rather, its actually a Mayan dialect. A man we spoke to there spoke some decent English too (although don’t count on that). Based upon recent feedback the price seems to be pretty fixed at $600 pesos per person, so there seems to be no need to negotiate. I would only caution if that you’re looking to have some more in-depth info then you may want to consider a tour. Otherwise you should be able to do it yourself just fine. Good luck! I just wanted to update you on a couple of things. I was at Muyil yesterday and the current price per person for the boats is 700 pesos. I don’t know if it’s gone up due to it being close to high season or because there are more people visiting it. We did it alone. The site is lovely. I wanted to comment on your suggestion for bug repellant. You should NOT use a spray with DEET since it will affect the ecology of Sian Ka’an. If you go to Muyil and Sian Ka’an, or any other preserve, reef or park in Mexico, you should use an all natural bug spray that will not harm the environment. That goes for sunscreen as well. Coral Safe is the brand that I’ve been using this trip. Broad spectrum uv a&in reef safe. Anywho, your blog was a huge help to us in finding out how to visit Muyil and the canal. It was awesome. Thanks for all the feedback. Its interesting to hear that they charged $700 pesos per person. I’ve been hearing pretty consistent reports of $600 pesos, so that’s a bit discouraging. I’d recommend for anyone else reading this to hold firm at $600 (although be sure to bring enough to cover $700 pesos, just in case). Thanks for the recommendation about bug spray. I didn’t realize that about DEET. I will try to update this article soon to reflect these environmentally friendly considerations that are important to be mindful of. Good advice! Glad to hear the blog was helpful and that you had an awesome visit to the Muyil, Sian Ka’an and the canal. Cheers! Question: we are most interested in the canal floating. We will drive on our own, and have our own snorkeling gear. Do you have to take a boat to the entrance area do the canals? Or, ar the canal areas accessible from shore? You cannot reach the canals from the shore. The canals are only accessible by boat. Its nearly a 30 minute boat ride from the shore to the canal that you float down, so that would be one heck of a swim. Thank You Very Much for your article which made our day!! My husband and I want to thank you for the detailed guidance to the diy tour of Sian Ka’an!! We had the most Wonderful day Thanks to You!!! It puts a big smile on our faces to hear that this was helpful! Thanks so much for taking the time to let us know! We’re really glad you enjoyed it! Hi John and Heather, What a great contribution to the DIY travel community. We come to the Riveria Maya for 2 or 3 weeks each year. We DIY every year. We do rent a car and drive all over. Yes, it is an expense but it sets us free to explore. We keep trying new things. We have been in most of the cenotes, etc. Sian Ka’an was on the top of our “gotta do” list. I had not yet figured out how to get to Sian Ka’an easily and have a good day experience at the same time. Your detailed plan was fantastic. We are staying in Puerto Aventuras. The drive to Muyil was 45 minutes. Parking at the Muyil Archaeological site is not a problem and seems very secure. The official Mexican Peso to USD exchange rate is 16.42P to 1USD. At Chedraui, the supermarket, the rate is posted at 16.61P to 1USD. To update a few things. The attendant at the Archaeological site is very helpful. The entrance fee to the archaeological site was 39P pp ($2.35 pp). The entrance fee to Sian Ka’an down the Sacbe was 50P pp ($3 pp). A boat captain was at the entrance to Muyil and I tried to negotiate the boat tour rate for the 2 of us but was unsuccessful, 600P pp ($36.50 pp). We gave the captain 200P as a reservation deposit and he met us at the boat dock after we walked down the boardwalk. Just the 2 of us on the boat tour. Captain Candido was excellent. We thought the entire experience was great. Thank you Steven for sharing your experience and providing an updated pricing on what you paid. Its most helpful! Particularly since some time has past since our last visit. I’ve actually been meaning to update this article, so your most recent information just inspired me to finally do it. Thank you! Its also nice to see that the trip is even slightly more economical now given the further devaluation of the peso. Glad to hear you had a great experience and the directions proved helpful. Cheers! Thank you so much for writing this article! totally helpful! Happy to help! Thanks for dropping by to let us know it was helpful! Very helpful. I’m down in Tulum right now and was dealing with the same issue of not being able to figure out how to visit Sian Ka’an without a paid tour. Thank you Wes! Glad to help! So how did it go at Muyil? The ocean side of Sian Ka’an sounds really enticing to us too and we hope to make it there next time we’re down that way. Dank je wel! Thank you! We also did not know now to visit Sian Kaan, but we did thanks to you. We visited the ruins for 39 peso p.p. The ruins are small, but it is a lovely and quite walk in the forest. The walk throughout the forest is easy accesible and Nice to do for 50 peso p.p. The stairs of the tower are very steep, but it is worthwile Doing. You end up at the Beach by the boatsman. Thanks to you we knew what to expect about the price. It is still 600 peso p.p. The Tour over the lagoon and through the canal is very Nice. But the floating is absolutely top!!! Thank you again! We had a wonderful three hours! We’re really happy to know this helped. Thank you for taking the time to let us know and for an update on pricing and your experience. We agree – floating down that canal was definitely the tops! This information was invaluable for my husband and I who wanted to visit Sian Ka’an without a tour group and weren’t sure where to start. We appreciate it! Thanks for the feedback Lauren! It puts a smile on our faces to know this info was valuable! Incredibly helpful, thank you! I followed the instructions to Muyil and directly onto the boat, and as of July 3rd, 2015 – everything was running exactly as you said. The boat guy told us it was 600 pesos/person. We were running low on pesos, and he said he could take dollars instead. Using a conversion calculator on our iphone (works offline), we showed him that 2 people at 1200 pesos calculated to $76 USD total, so he was willing to accept $80 USD. We waited about 20 minutes for the bus to return to Tulum town, and when it finally came by it didn’t stop. As we waited for a taxi, a Collectivo (shuttle bus) drove by, so we hailed it down instead. It was 40 pesos/person from Muyil to the bus station in Tulum. Great deal if you don’t want to wait for the bus, or if the bus doesn’t stop for you. Thanks again! Amazing trip in the lagoon, don’t miss the ‘natural lazy river’/float canal! Thank you for this update of information and we’re really glad to hear this info was helpful! Seem that 600 pesos still is the going rate and no negotiation. Good to know! “Oh no” about missing the bus, but it may have been a happy mistake since you got such a good deal on a taxi. 40 pesos per person is nearly the same price as the bus. Thanks sharing that info, as I’m sure that is very helpful for everyone to know! Ah, yes, the canal float – so much fun! Thank you for the information. I like to avoid tours as we’ll and was wondering how to get there when I found your blog. Travelling these days is really easy when there is great people sharing experience as yourself. Thanks Cristina! Hope you found this helpful! Didn’t have time to do this last year but will in a month. Thank you for this article as I will be heading out on my own and speak Spanish. Hopefully the boat owner will show me tons of wildlife which is what I’m going for. Not an organized tour person at all. So appreciative of your posting your experience. We hope you had/have an awesome experience out at Muyil and we’re really glad to hear you found this post helpful! Thank so much for stopping by to let us know! Its really a good plan for independent travel. Thanks for this great article. I’m actually just searching around the internet after visiting Sian Ka’an through Muyil. We arrived there a couple days ago from a resort, just to see the Mayan ruins, and were pleasantly surprised by the whole experience we had there (we also try and look up as little about the ruin sites before we go because its so much fun to walk through and be surprised by each structure). We had the place to ourselves! I would not trade this intimate experience for anything, well worth going alone or with a small group of friends. Its true i didn’t learn as much about the animals or the ruins but the experience of just quietly discovering and appreciating both the stunning nature setting and the accomplishment of these ancient people is more than a fair trade off. We stopped off the side of the road a few minutes from Myuil to ask for directions, and it just happened to be from a laguna boat operator. Our friend driving who was the only one of us to speak Spanish, had a long conversation with the guy. At one point the guy made the sort of head chopping motion while speaking (to which in my mind was obviously part of some tourist decapitation plan and could not figure out why my friend was not getting us out of there immediately). Turns out he was offering us a better price on the boat tour, 400 peso per person (four of us) and said we would have to agree to that now and not talk about it down at the laguna because he would lose his job for giving us a good deal (head chopping motion to emphasize his point). We didn’t take him up on the offer, we had no plans of spending that much time at this site. We also had no concept of what to expect for pricing and couldn’t tell if he was ripping us off or genuinely giving us a deal. To others traveling this area and feeling adventurous with your rental car I highly recommend seeing Becan. These ruins are unbelievable. Also had the place to ourselves. Its a long drive from the resorts (three plus hours depending on how fast you drive) but completely worth the trip (can do city of Chetumal in same day). I would give Tulum 3/10, Muyil 7/10 and Becan 11/10! Thanks so much for stopping by and sharing your detailed account of your trip to the Muyil ruins. It really makes it so much more special being able to tour these ruin sites without the tourist hoards. We will have to check out Becan next time we’re in Mexico – that sounds fantastic. Thank you for the recommendation! That’s pretty funny about the head-chopping motion. Seems like his price was a genuinely good deal for what seems to be a bit better than the going rate. Cheers! How is parking at the entry of Muyil? Is it safe to park there? The car park is just off the major road and the ticket booth is in site of the parking lot. I thought it looked completely safe but there is always some level of risk leaving valuables in your vehicle. Thanks to your info I was able to find the road to the boats at Muyil! I was in Mexico with my 65 year old mother who loved to do a boat trip. We paid 700 pesos per person, but ended up a bit disappointed. The area is gorgeous, the floating through the canal for me was fun, but for my mother who didn’t float it felt like a bit of a rip-off. Hardly spent any time in the boat, besides the 5 minutes to and from the point where the Maya-ruin is and where you enter the water to float. Expected more of that. They promised us a 2-hour tour, we were back within 70 minutes. We even raced high speed through the wetlands. Didn’t know that was possible. So when someone has plans to go, in my experience it is worth the trip and money when you go floating the canal. If your not, don’t go. And when you go: make sure they show you the area. Thank you for providing us feedback from your experience and the price you paid. Floating down the canal was our favorite part of the trip, so I can understand how your mother may have felt disappointed and not worth the 700 pesos without the float, particularly if your trip was a bit rushed. During our trip, we went slowly through some canals and sped through other open areas. We enjoyed a the mix of both fast and slow. Having your feedback about your 70-minute trip, this is good to let others know so that they can get a time estimate and try to hold the boat drivers accountable to that. Thank you so much for this information. Your diligent research has saved us so much time! And as you know, time is one of the most precious things we have. Good karma to you! Awesome! Thanks for taking the time to drop us a note and let us know. You just put a smile on our face. Happy travels! Thanks so much for posting this detailed guide. We are headed to Tulum in a week for a return visit and are thinking of visiting Muyil this time. We will have a 2-year-old in tow – any thoughts about whether this combined trip of ruins and boat ride would be too much for an adventurous toddler (with his own life vest, of course)? We are thinking he might like the boat ride and we may need to forego the float option, if we go for it. Thanks again – this is so helpful! i just did the diy tour thanks to your great article. thanks a lot for sharing it. indeed it is very beautiful. just a comment about the savings you mention. I think a tour with a guide might include a more knowledgeable guide who might tell more about the biosphere, animals or show you a bit more of the animal life? that is just a supposition. at least visitor guide you would have a guide who speaks something else than spanisn. Yes, that is indeed true. Good points. A guided tour would certainly offer a much more information about the wildlife and history of the area. There is some signage in Muyil and at the boardwalk but it is minimal. And the boat drivers don’t speak English to offer any commentary about the surroundings. They simply drive you to the points of interest around Sian Ka’an. A guided tour would provide much more info on everything and would be an easier option, but it would come at almost double the cost of this DIY itinerary. So it just comes down to how much someone wants to spend and their desire for in-depth info (or just seeing it on your own). This info is exactly what I was looking for. I plan to do this same excursion on my own in 2 weeks. Thanks for the great detail! So glad to hear this is helpful! Thank you for dropping by to let us know. Happy travels to Mexico and to Sian Ka’an! Originally, we planned 1 night in Punta Allen and then would drive back out, catch a ferry to Cozumel for 2 nights. After the harrowing trip down that looong, battered and bruised road (it is worse than anything you could have read) the beauty and secludedness of Punta Allen took over and we knew we would be staying longer. We cancelled the Cozumel leg and extended our stay at PA, with the help of our gracious host Nikki at Serenidad Shardon, which was a beautiful property right on the beach. Punta Allen ran to a different vibe of life, something I cannot accurately put into words, but we left there a changed people. If you ever are back in the area, I would highly advise you to also make your way down the road. Thanks again for the tips, It has been a pleasure following along on your journey. Thank you so much for this detailed guide to DIY’g a tour of Sian Ka’an. I used to only DIY travel, but because of personal constraints last few years, I’ve had to rely more & more on guided tours. It’ll be so nice to do this on our own. Btw do you happen to know if snorkeling can somehow be included in your DIY visit to Sian Ka’an? I’ve noticed that all the outfits offer snorkeling as part of this excursion. That would be a cool bonus. Thanks again! During the canal-floating portion of the boat tour you can snorkel there. However, they did not have masks and snorkel with them. So you must come prepared with your own gear. We brought our masks and it was neat to see the aquatic life such as fish and crabs in the mangroves. Thanks so much for letting us know! I’m really happy to hear that people our finding this article. Have a great time in Sian Ka’an and please drop us a line if anything has changed or was unclear. Happy travels! Amazing! Thanks for your information. I’m looking for some information about Sian Ka’an Biosphere Reserve because I don’t want to join group tours like you. Thanks a lot! Am so glad to hear this helps! Hope you have a great time visiting this beautiful place! Hey 🙂 Moving my comment to the correct article – Are these conversions correct? My calculations are different. Just wondering what to budget as I’m definitely going to try your suggestions! Thanks! We paid 1,150 pesos for the entire boat excursion and float for two people, which is $88.57 USD (at current exchange rate) or a little more than $44 USD per person. I’d bring at least 600 pesos per person for the boat excursion, 60 pesos per person for bussing there & back, 50 pesos for ruins, and 50 pesos for the boardwalk. At about 760 pesos per person, that’s just under $60 USD and about half the cost of the packaged tours. Definitely bring pesos (not USD) and bring some extra, of course, just in case. Good luck! Its a great adventure! Let us know if any other questions (or if I missed a miscalculation) and please stop back by this page to let us know how it went or any updates (as things do change). We found your guide very useful and have successfully visited today. The only thing we found was on entering at the Muyil entrance we were charged 50 pesos but they did not give us tickets. We were then broached by someone who tried to make us pay again as we had no proof we had paid. My husband had asked for tickets at the time. He then made us pay for a small hand gelled video camera 45 pesos. The notice says these hares apply to professional camera with tripods !! The man became quite aggressive. The other consideration is, when you leave the boat to swim in the lazy river,all your belongings are left unattended as the guy leaves the boat to meet you at the end point. We had a great time and nothing went missing. We were charged 600 per adult and 400 per child and there was no bargaining entertained ! Thank you for the comment and sharing your experience. I’m sorry to hear about the hassle you encountered with the entrance fee and being charged for the video equipment as well. That must have been incredibly frustrating. Aside from those setbacks, we’re happy to hear you had a successful visit and were able to enjoy the beauty of the reserve. Price for bus from Tulum 27peso adulte, 14 peso kid under 12 years. 40peso the ruins, 50peso adulte – 25 kids for the boardwalk. Return with collectivo 25 pr person to Tulum. Thank you for this great advice! Made it soooooo easy for us, just go as described. Yay! So happy to hear this post made your trip to Muyil & Sian Ka’an easier! Also, thank you so much for confirming recent prices. Was aware that kids are negotiable, typically half price, but didn’t know at what age. So thanks for that added piece of info! And what a great adventure to take kids on! Follow us for more pics like this!